Hello everyone! 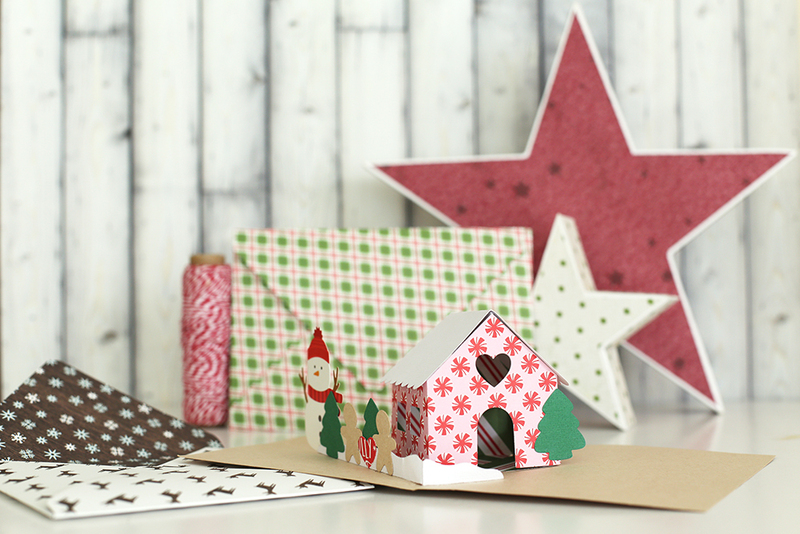 It’s Eva Pizarro on the blog today sharing a quick tutorial to make these lovely pop up cards. The new Evolution Advanced Pop Up Dies are so pretty! 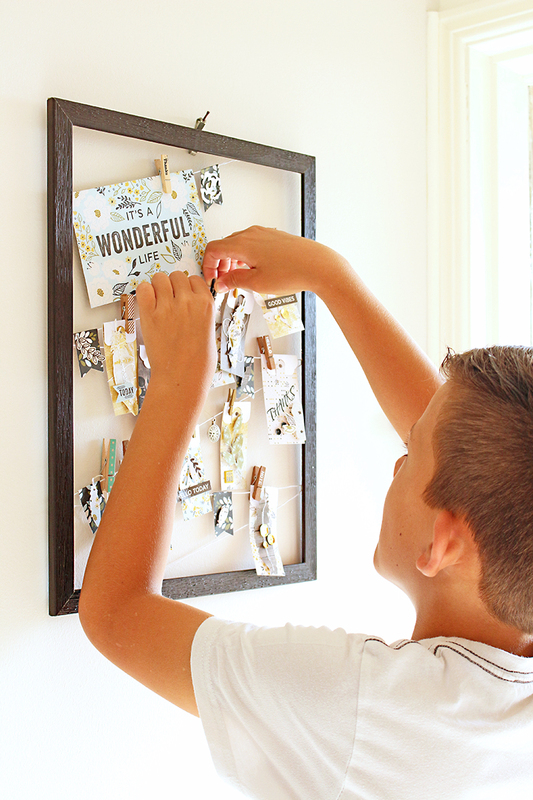 I can assure you that you can make beautiful cards and wow all your friends. Who doesn’t love a 3D card? To make these cards I started with my base. I used my Precision Press Tool and one of the layered stamps to make the cover. 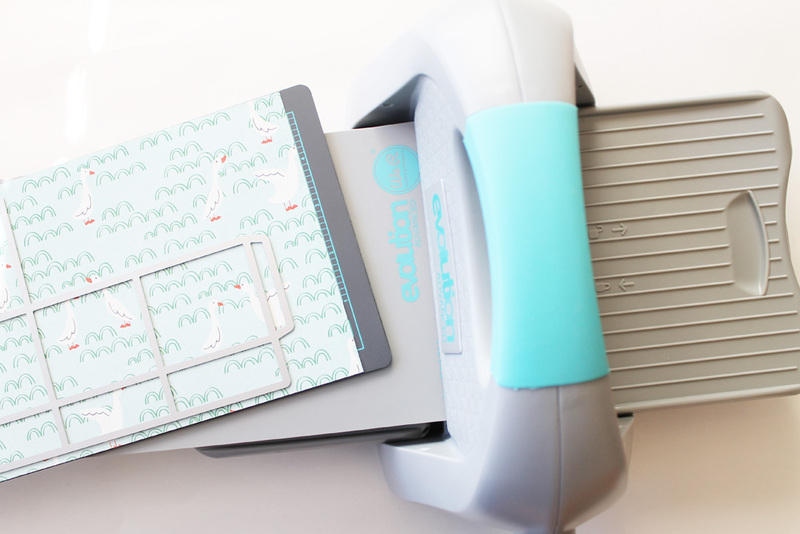 The Precision Press lets you stamp multiple times over the same image, so it’s perfect for beginners! 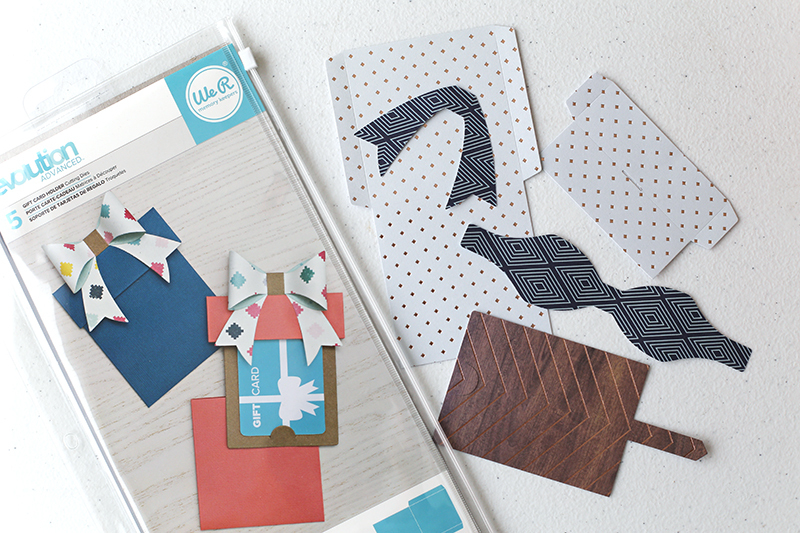 I like to use a small piece of washi tape to make sure my project doesn’t move. To make the houses simply run your dies through your Evolution Advanced. 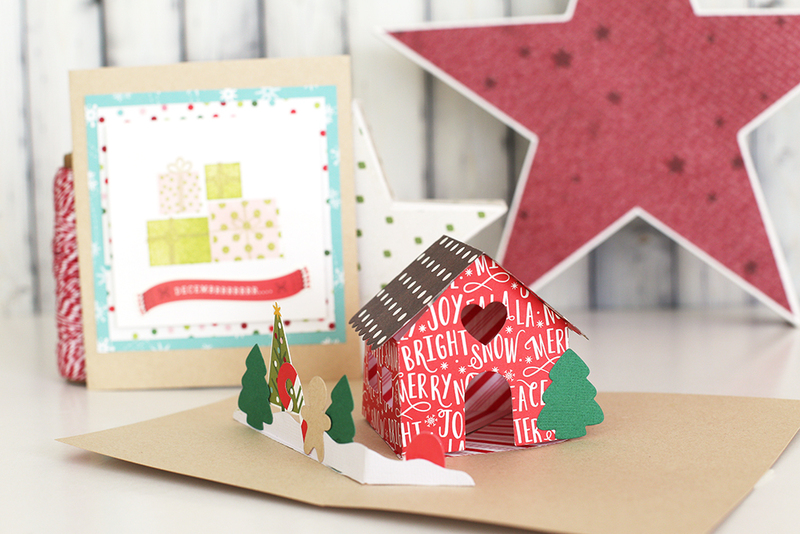 I used some papers from the Holly Jolly collection by Pebbles Inc. The houses are beautiful! I think they would look amazing as a village or as an advent calendar too! Last but not least I made my envelope with my Envelope Punch Board. 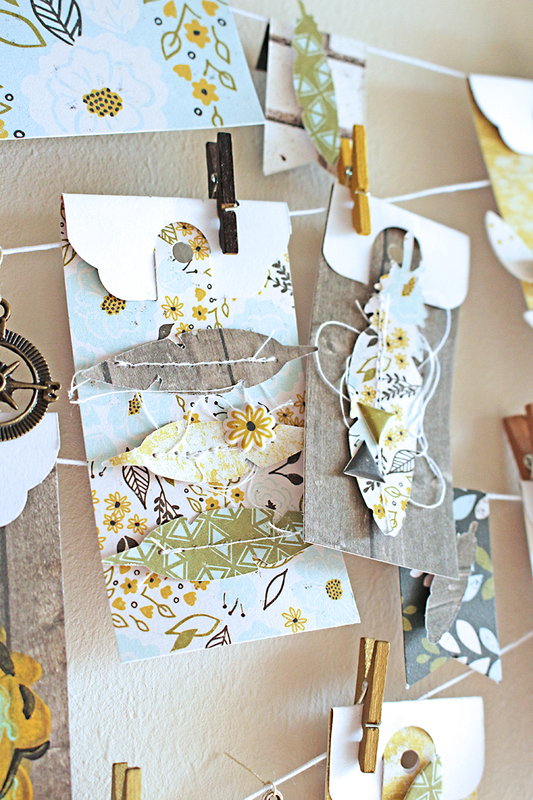 With the Envelope Punch Board you can make envelopes in different sizes. 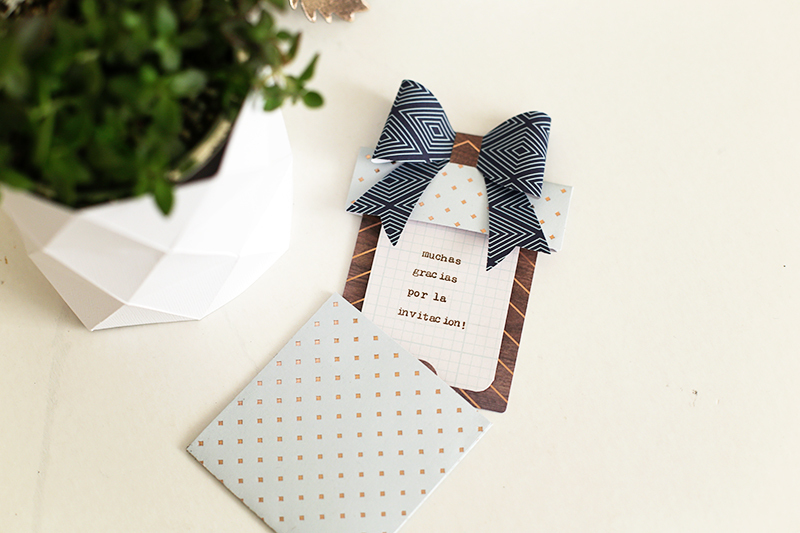 Use your favorite paper for the outside or line the inside of a solid color envelope for a special touch! 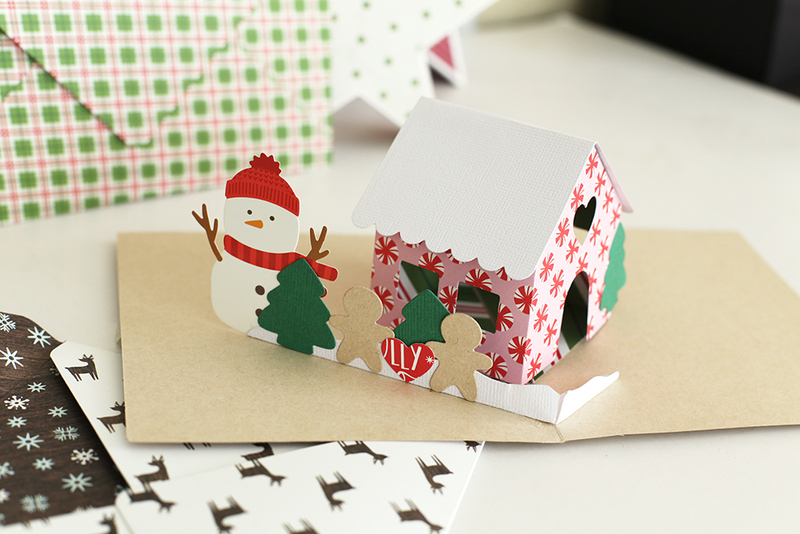 You can decorate the houses with the dies included in the set and you can include pre-made die cuts or stickers, just make sure they fit inside the card once closed. This is the second card I made, I only changed the colors and some embellishments. Aren’t these houses super cute? 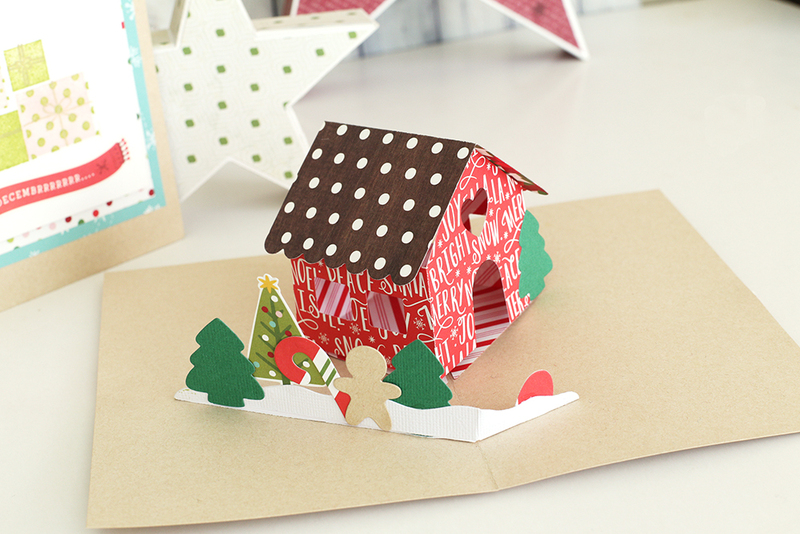 Now you can make these pop up cards in minutes! Hello, We R readers, Laura here! Some of my nieces and nephews are getting older and no longer want toys for their birthdays. I like to do gift cards because then they can buy whatever they want from a store I know they will love. However, I feel like giving a gift card by itself can be a little boring. 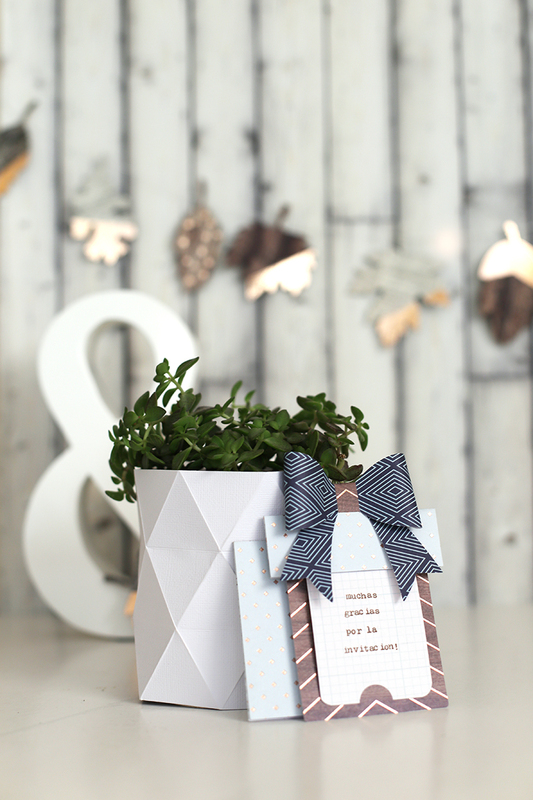 The new pop-up gift card holder dies are perfect for creating a special card you can use to give a gift card that makes it so much more fun! 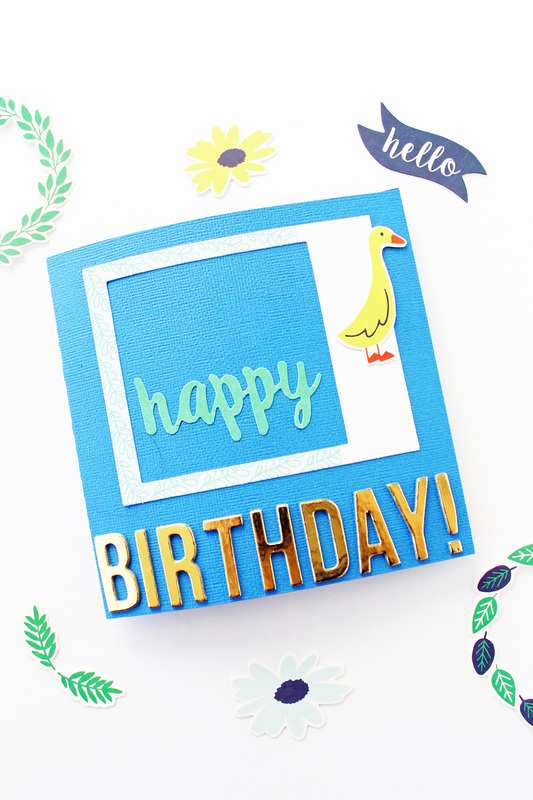 To start creating your card, you will need to cut out one box and two smaller card holder pieces from double-sided cardstock using the pop-up gift box dies and the Evolution Advanced. Using the magnetic mat really helps to keep everything in place. 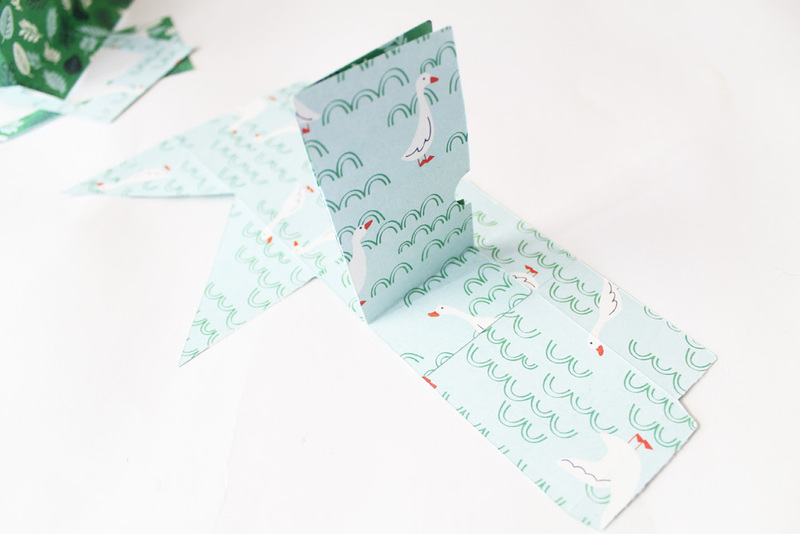 To assemble the gift box, you will start by adhering the two card holder pieces together and then folding in the middle. The half circle notches will line up once folded in half. 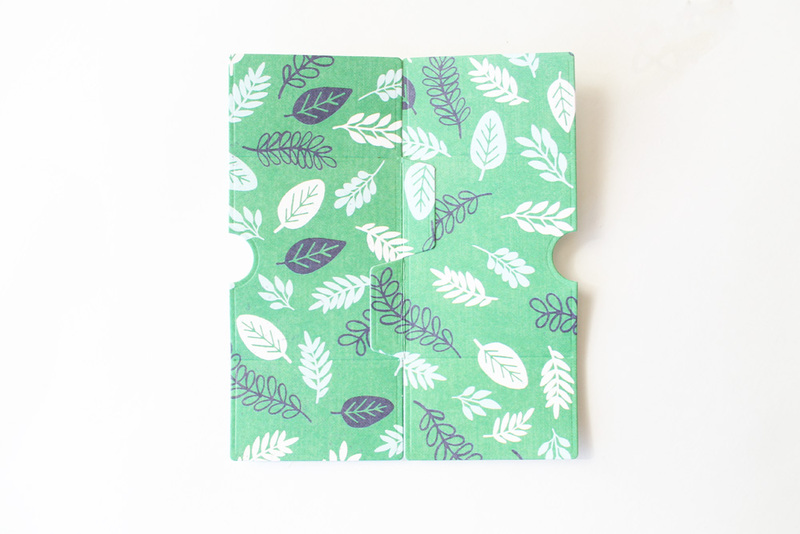 Fold back the ends of the card holder and adhere to the third square on the box die cut. 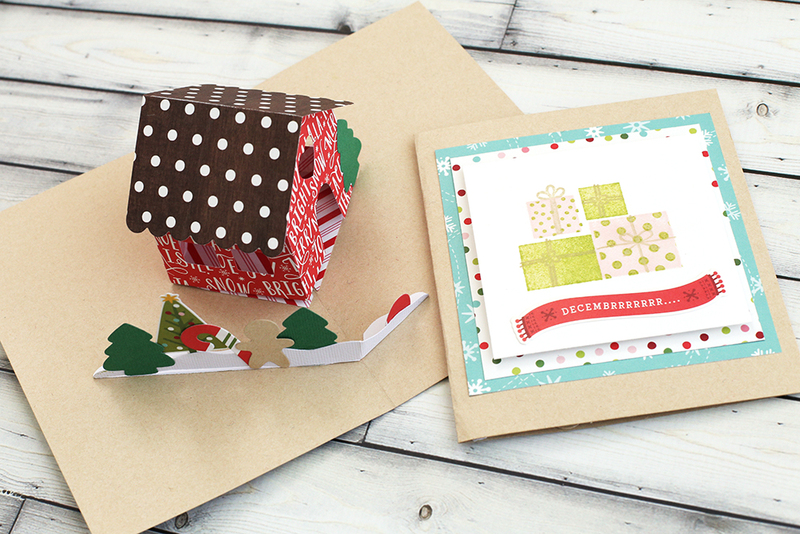 Then, you will fold the opposite ends of the card holder back and adhere to the first square on the box die cut. (This is the one with the first triangle flap.) Adhere the flap on the end of the gift box to the opposite side to close the box. 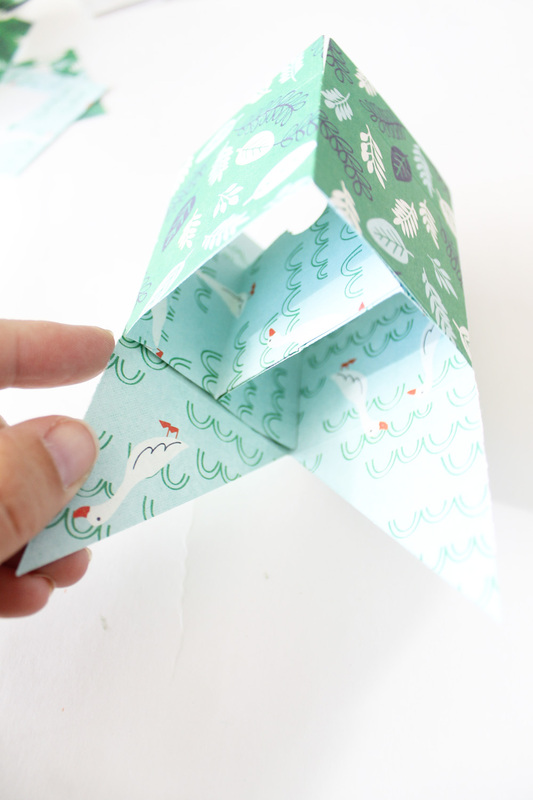 To attach the box to your card, you will adhere each of the triangle edges on the bottom of the gift card box to either side of the fold on your card. I created a card base from textured cardstock. 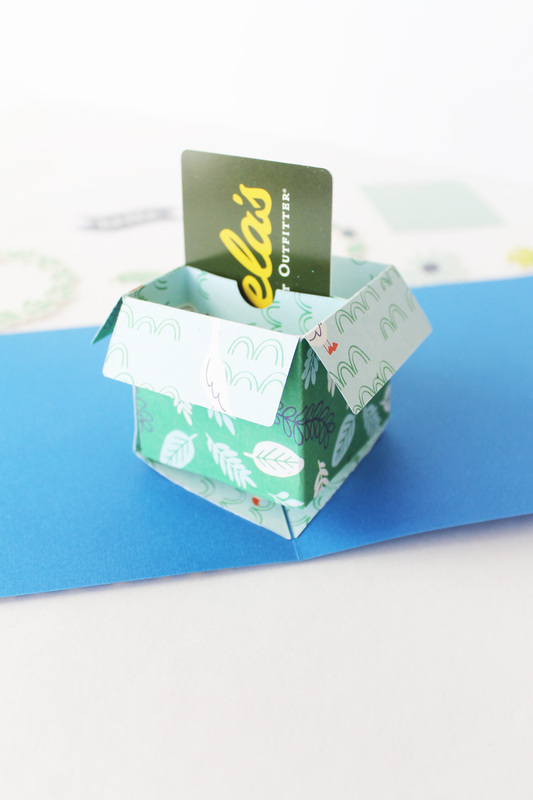 My card is 5 ½ x 5 ½ inches wide and was the perfect size for adding the pop-up gift card box. I embellished the front of the card with elements from the Flower Girl collection. I started with a frame. Added a “happy” sticker and a little goose sticker. 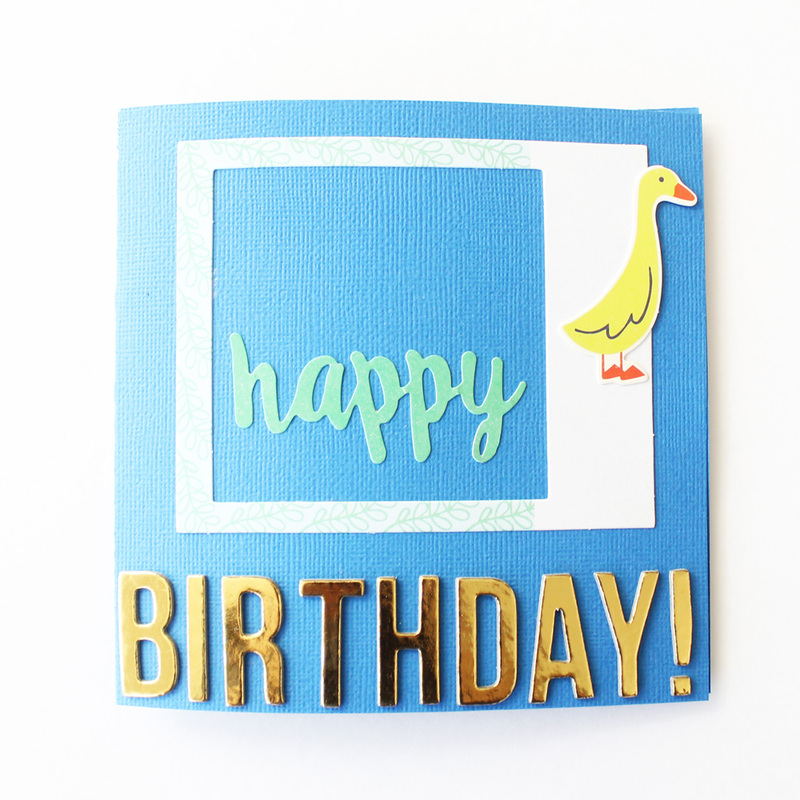 I finished it off with the word “birthday!” using gold thickers. 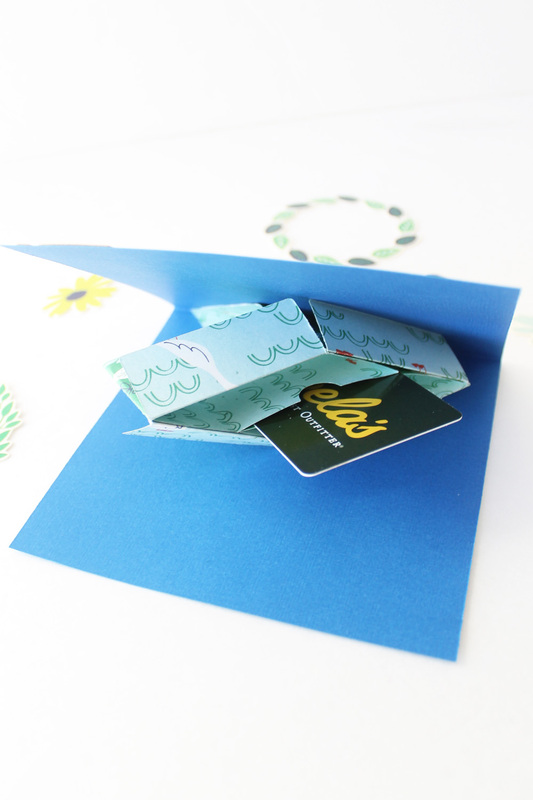 This pop-up gift card box birthday card is the perfect way to send or give a gift card to someone special. 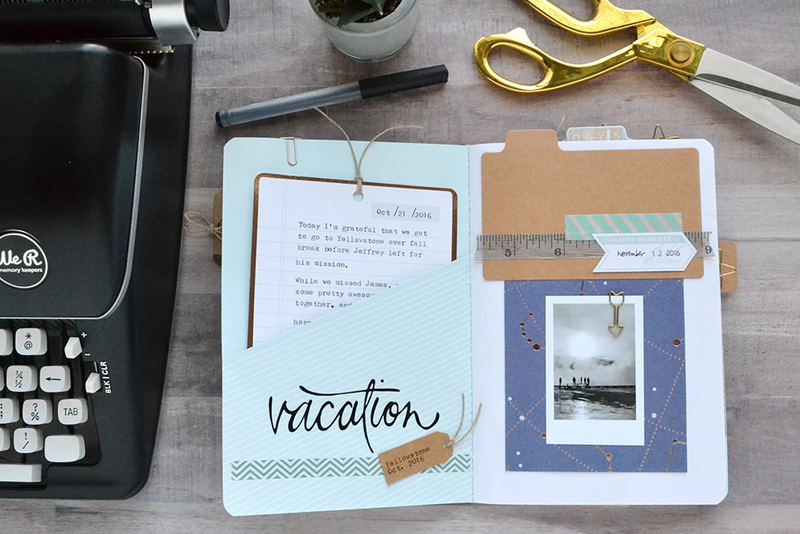 And since you are cutting out all the pieces yourself, the possibilities are endless for designs, styles and holidays. 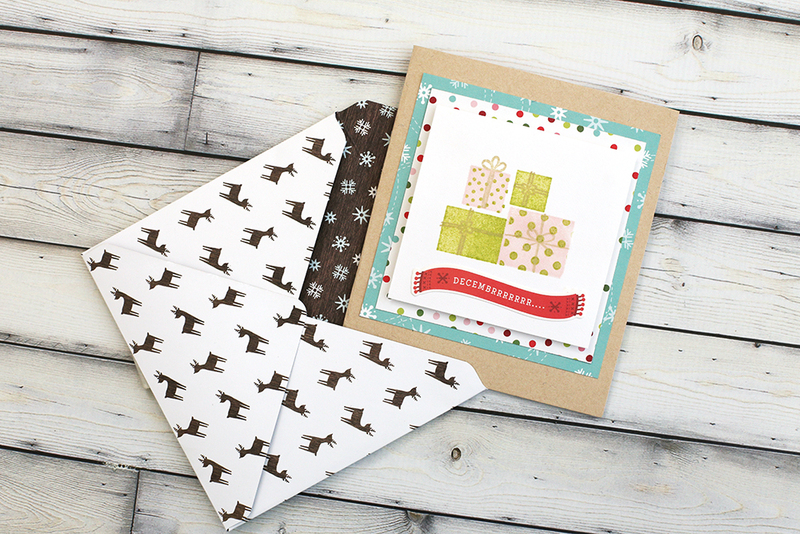 These cards would make wonderful Christmas gifts as well, simply by changing out the sentiment on the front. Hello We R Fans! 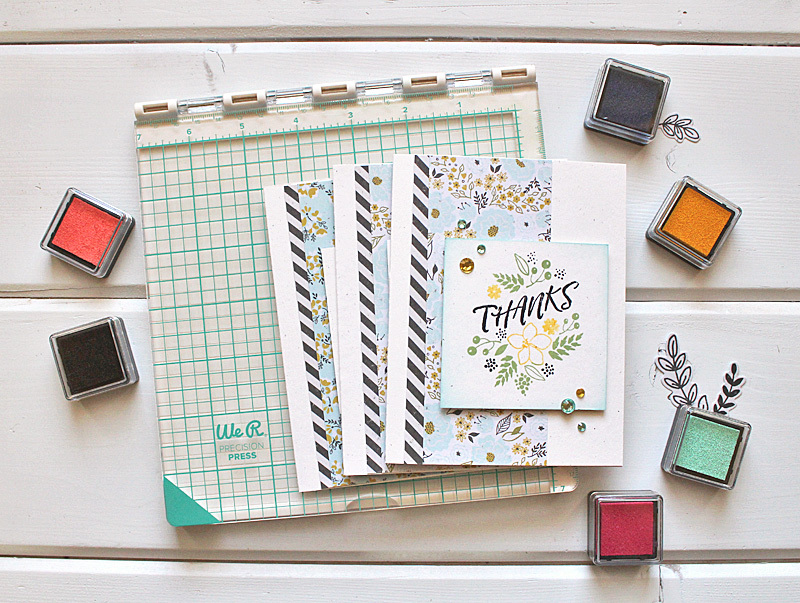 Kimberly here today to share a card set that uses the fantastic new Precision Press! 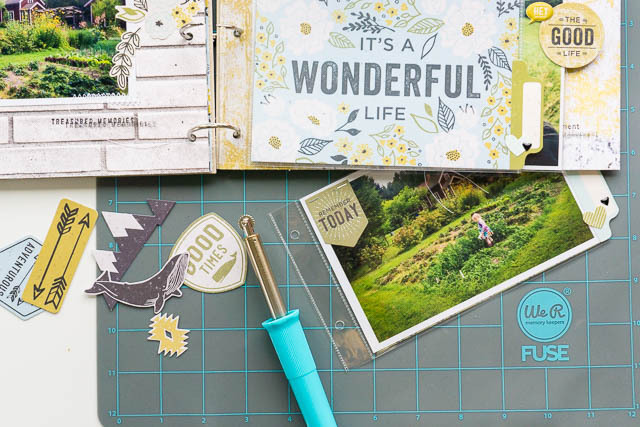 This new stamping tool has so many great applications but We R Memory Keepers took it another step with incredibly inventive stamps that are ideal with the Precision Press. 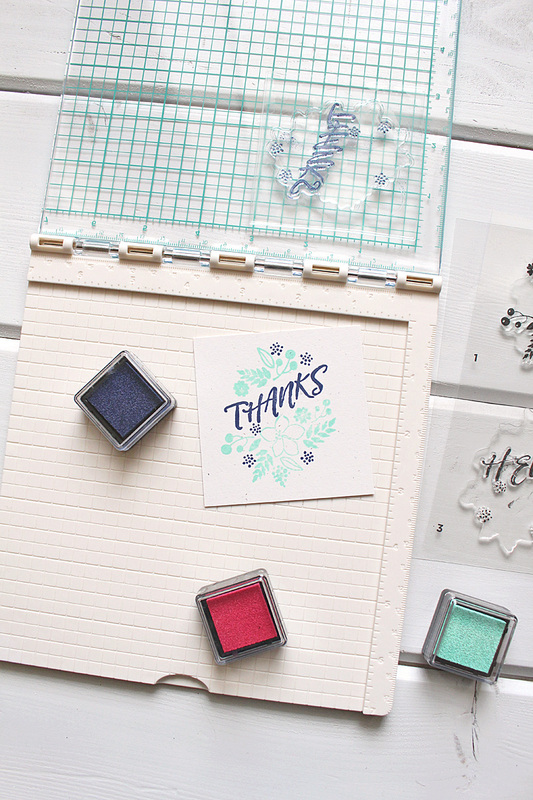 This is going to be your go-to stamping tool! 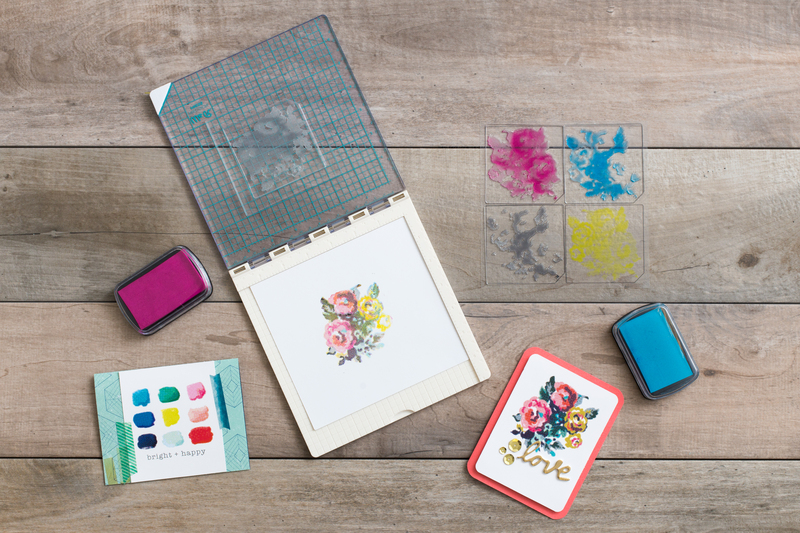 The Precision Press allows you to stamp repeated images, in exactly the same place. Because of that, creating multiple cards is a breeze! 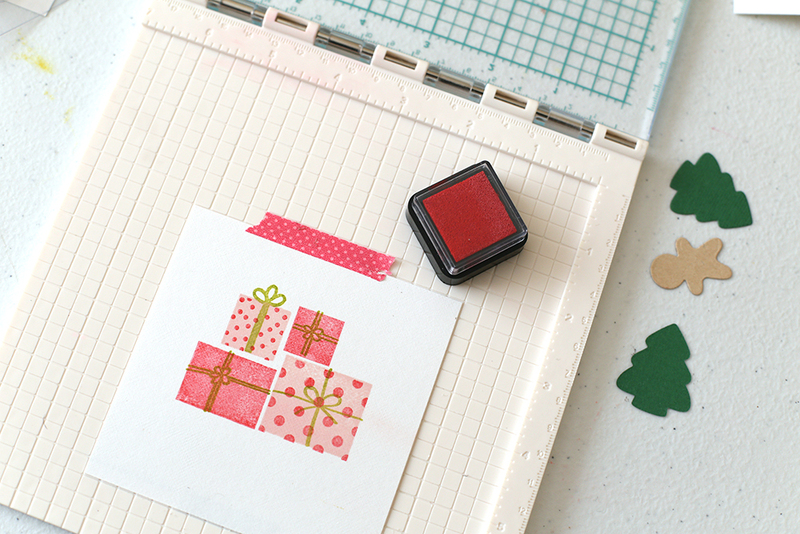 Simply place your stamps and paper, apply ink, and close the lid. Perfect placement every time. And if you happen to miss a spot or two with ink, no worries, apply more ink, and close the lid again! No more missed stamped images! 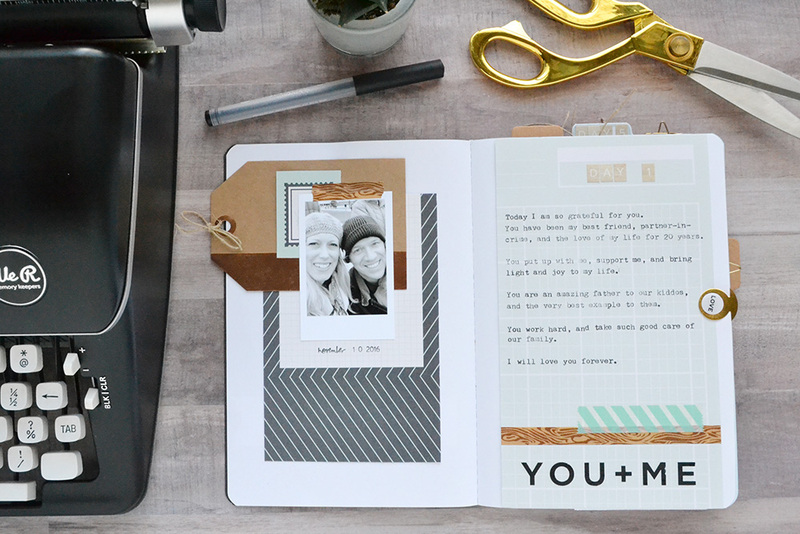 We R Memory Keepers took the idea of this tool to another level with the Layered Stamp sets. The set of images comes with a guide image. 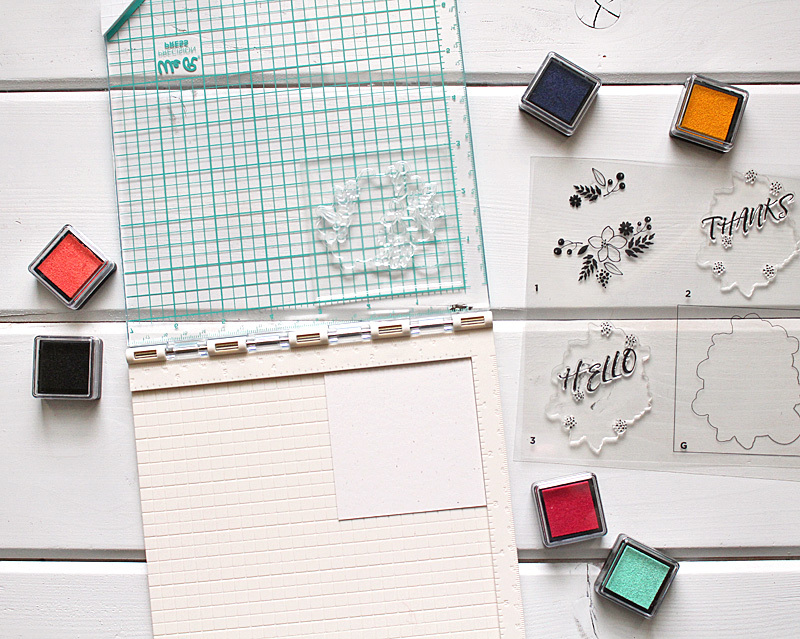 This thinner image keeps everything in place as you change stamps. 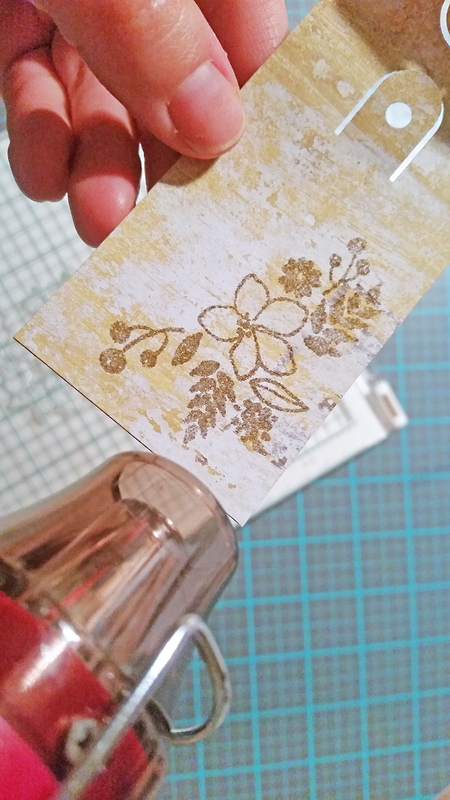 I began my card set by placing my card stock onto the base of my Precision Press. The surface of the base has a texture to it that grips and holds the paper in place. I then placed the guide image down on the clear lid of the Precision Press. The first image, which is numbered, perfectly fits inside the guide image opening. This image is thicker, which allows you to apply ink to the raised image, but not the guide image. It is possible to get ink on the guide image, but because it is thinner, it will not leave marks on your card stock. Once your ink is applied, close the lid and push down on the image. 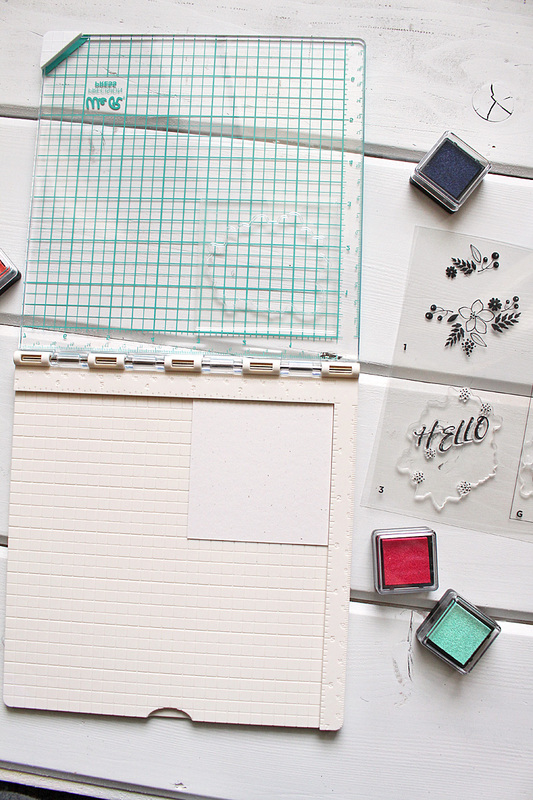 Leave the stamps in place and you are ready to stamp the next piece of card stock. You can continue this process for as many images as you want to create. Once all my floral images were stamped, I wiped the stamp clean and removed it from the Precision Press. The next image, the thanks sentiment, was placed inside the guide image. Again, it fits perfectly, lining up the images. The inking, stamping, repeating process continued. 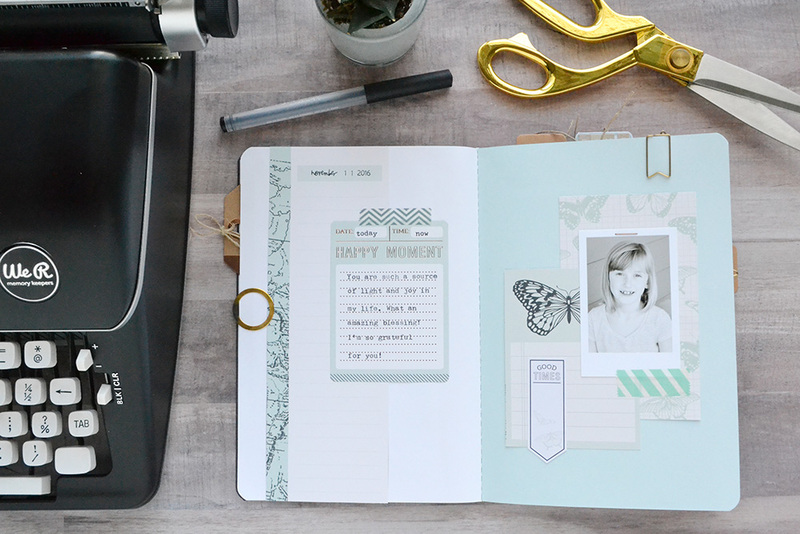 Because I knew my images would stay in place, I experimented a little with the Banner Layered Stamp to add more color and depth. 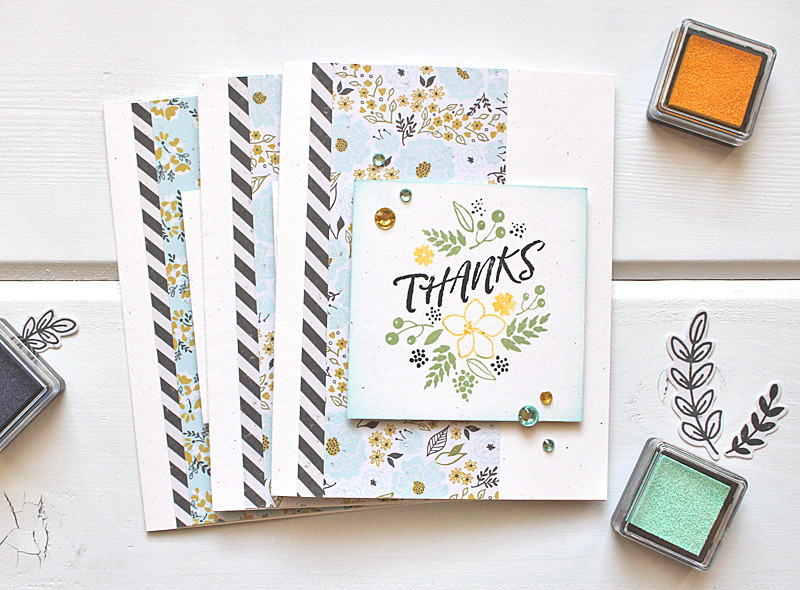 On my thank you cards, I applied green ink to certain areas of the floral image and stamped my card stock panels. After cleaning off the image, but leaving it in the guide image, yellow ink was added to the stamp. The possibilities are endless! 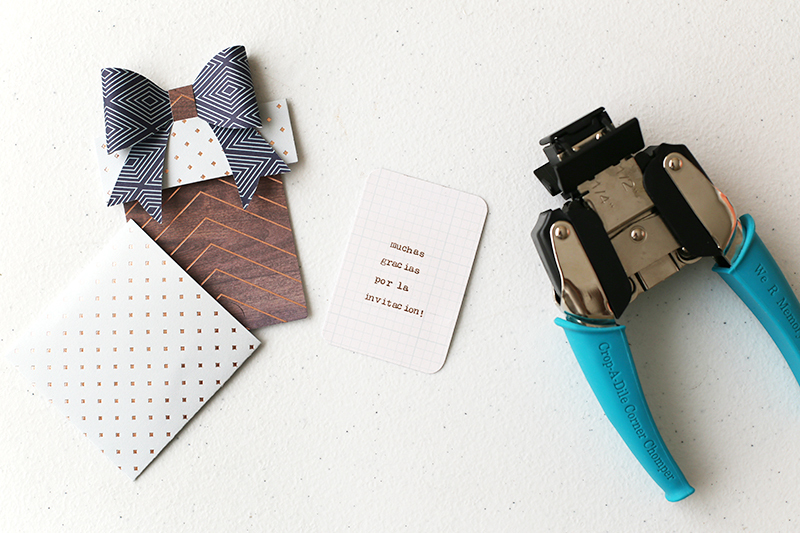 What is your favorite part of the Precision Press? Hello We R fans, and happy Friday! We hope our U.S. friends had a great Thanksgiving holiday yesterday, and that you all enjoy your weekend. 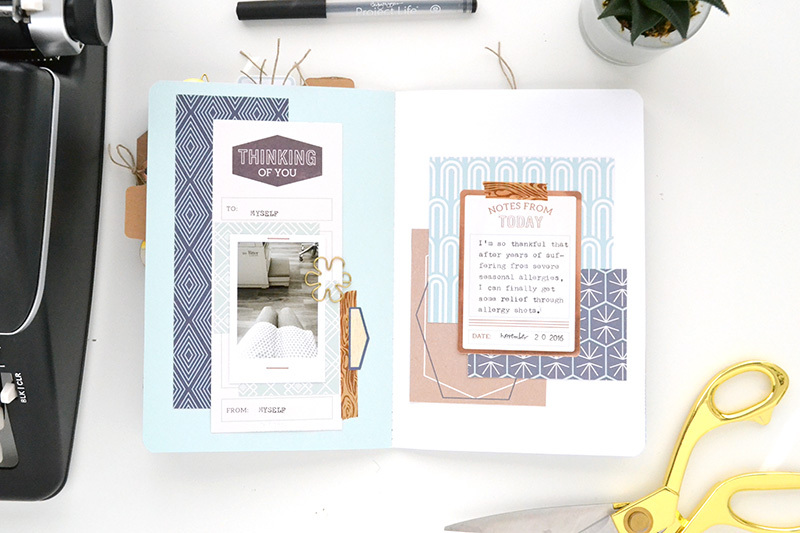 Today we’re thrilled to have guest designer Ida Rosberg join us with an adorable mini album she made with the High Five collection and the Photo Sleeve Fuse! 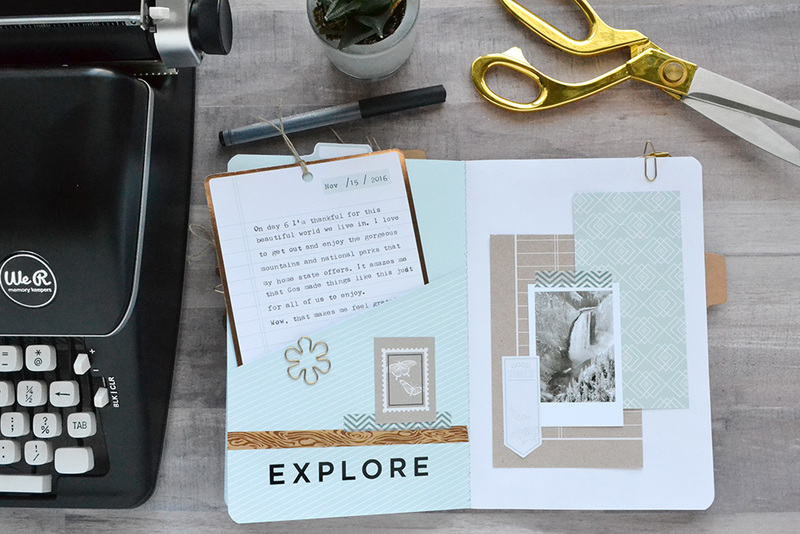 I’m so excited to be a guest designer on the blog and I will share a mini album I created using the High Five collection and the fantastic Fuse tool! The High Five collection was a perfect match to my photos from a trip me and my daughter made this summer. It was a typical Swedish summer… cold and rainy! 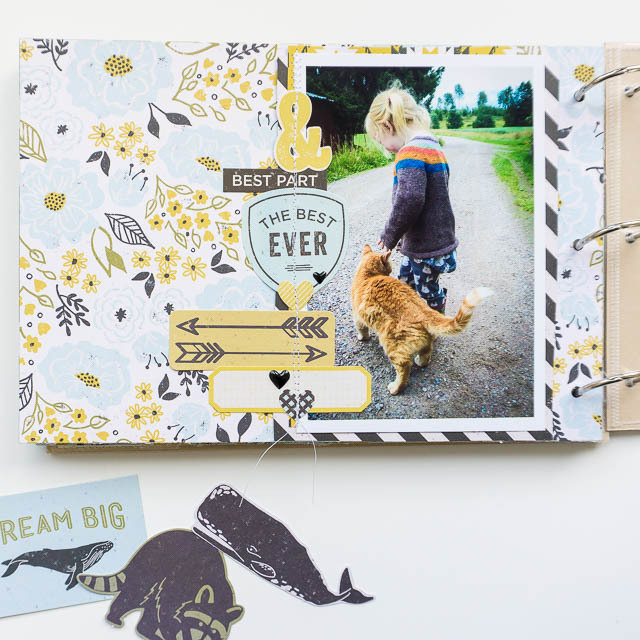 The album is a mix between regular pages and pocket pages. Here is one example of a regular page. I just love the mix of the yellow and the blue. I made a lot of different pocket pages for my mini. Some for just one 4*6 inch photo and some for two photos. I also added some flip pockets to add interest! The tabs on the side of the pockets to show where there is more to see! The holes are punched with the crop-a-dile. Easy peasy! My name Ida Rosberg and I’m from Sweden. 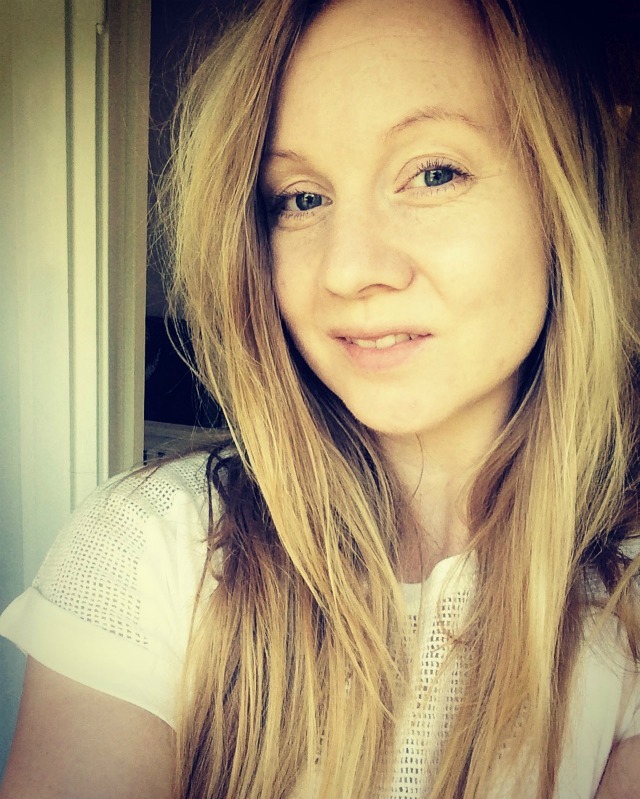 I live outside of Stockholm with my husband, dog and three year old daughter. For as long as I can remember I have been crafting and about ten years ago I started to make cards for Christmas and birthdays. 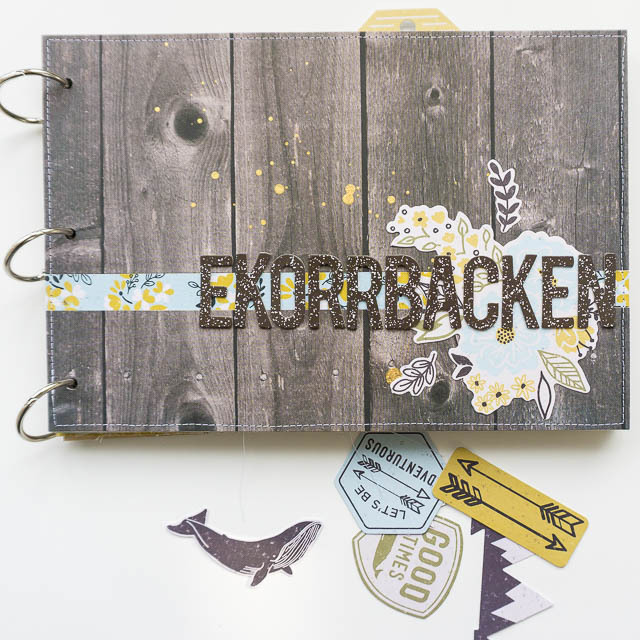 Then I found scrapbooking and loved it. I started with a few albums… but wanted more photos per page. Project life was perfect! 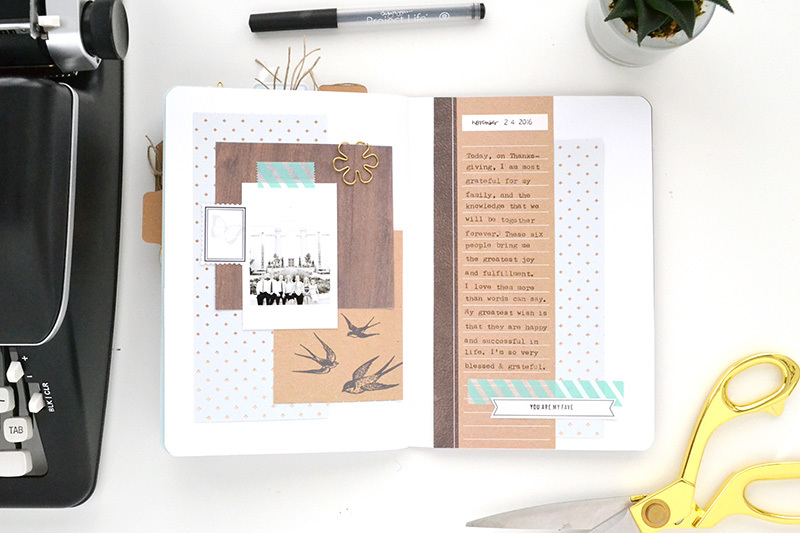 Today I mix project life with traditional layouts. 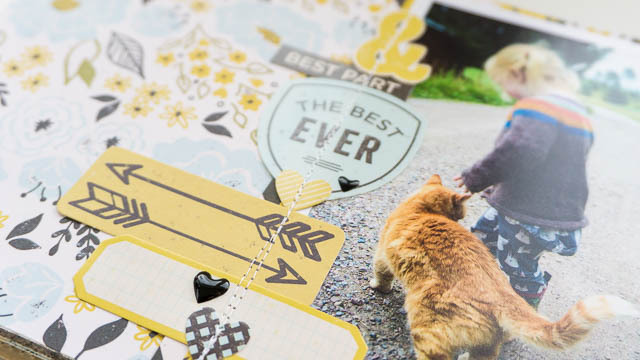 The main reason I like scrapbooking is because it calms me down and makes me peaceful. It makes me focus and forget about everything around me… Another big reason is because it focuses on the positive sides of life! I often scrap happy moments and photos of people I love… and also, it’s great to have so many memories documented! The fuse tool (of course)! Take time to look back at your old albums and layouts (or cards)! 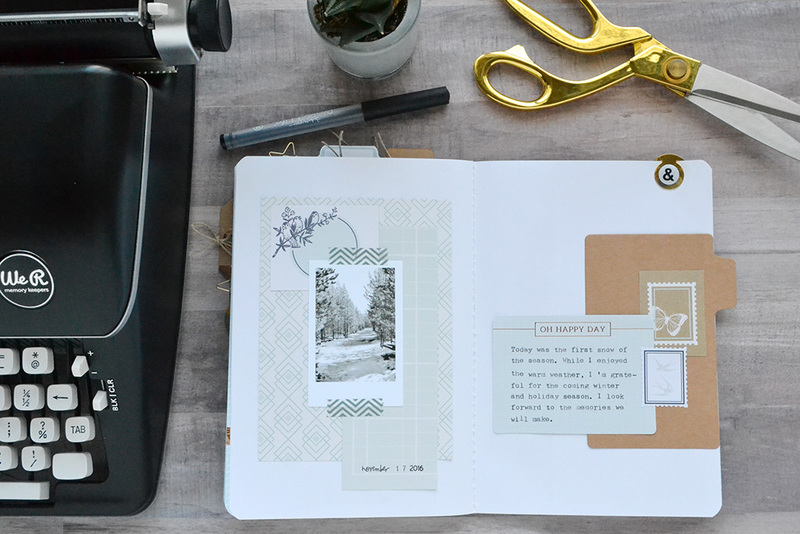 The thing about documenting your memories is to help you remember. And layouts you weren’t happy about when you made them often looks better some months (years) later. It can also be good to show someone else, family or friend. Family and friends are often less critical than you are about your work! Hello, and Happy Thanksgiving to our U.S. friends! 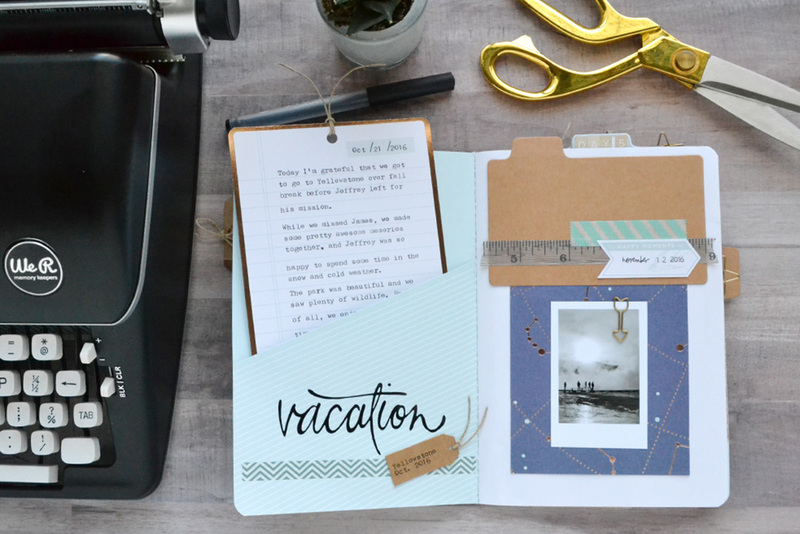 It’s Aly here with you today to share the last week of pages in my 15 Days of Gratitude journal. If you missed the first two parts of this three part series, you can check them out HERE and HERE. I enjoy this project so much, and am always glad for the chance to focus on the good things in life this time of year. 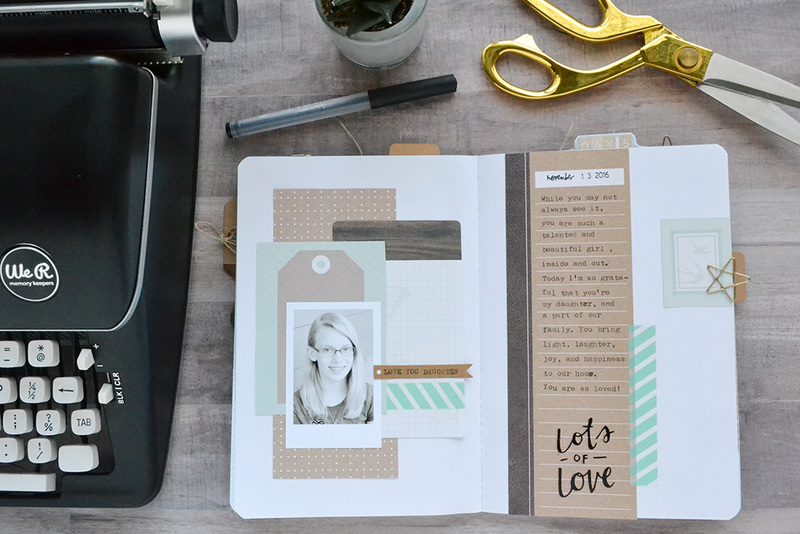 Today, along with the completed pages, I wanted to share a few tips with you. 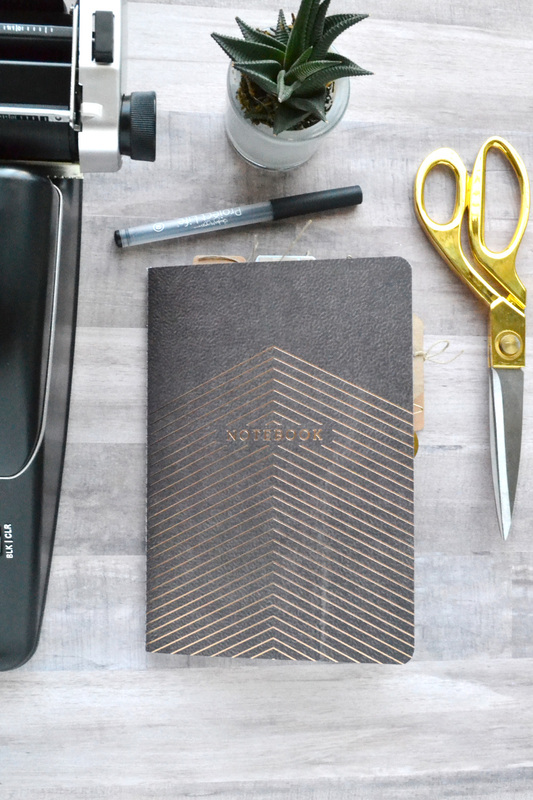 First, I find it easier to gather all of the supplies that I plan to use for the entire journal and keep them in a basket or bag out on my work surface. That way when I have time to work on it I don’t have to go fishing around for my supplies. 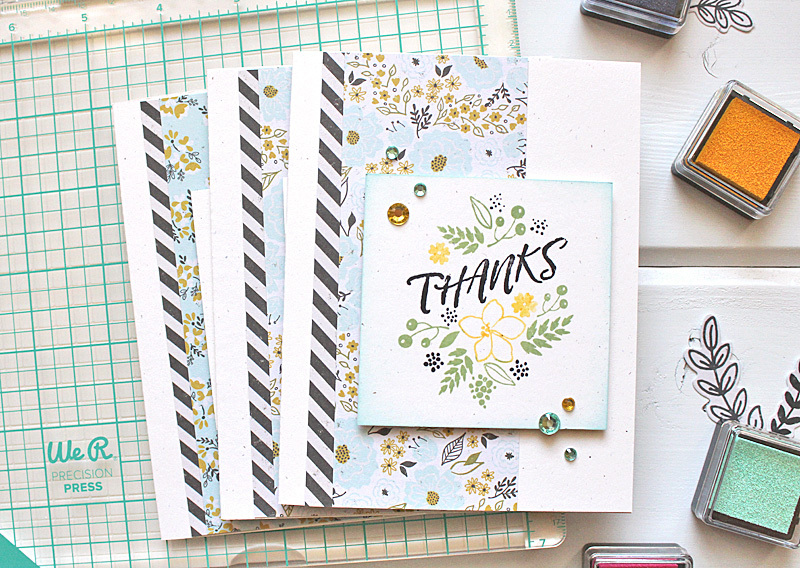 I also used a couple of paper pads from the Typecast Mint collection. Using coordinating paper pads made it easy since no matter what papers I chose, they worked nicely together. 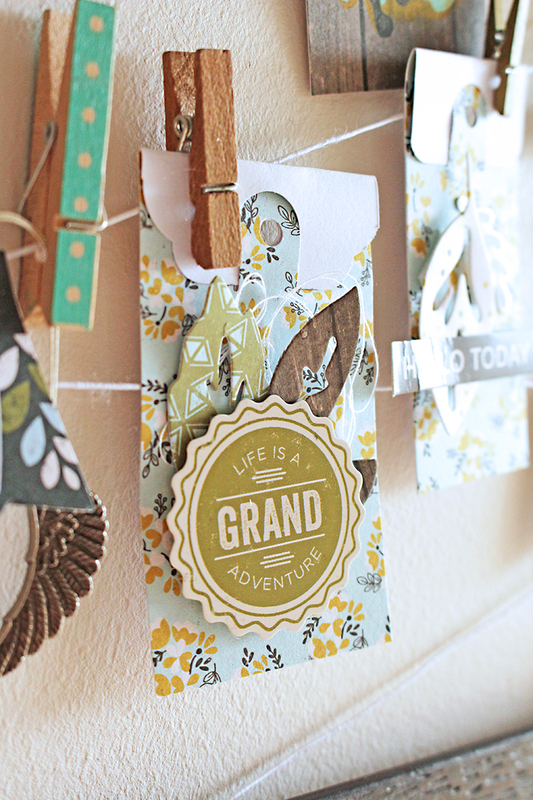 I also used a few packs of coordinating stickers, tags, and labels to use as accents and layers. 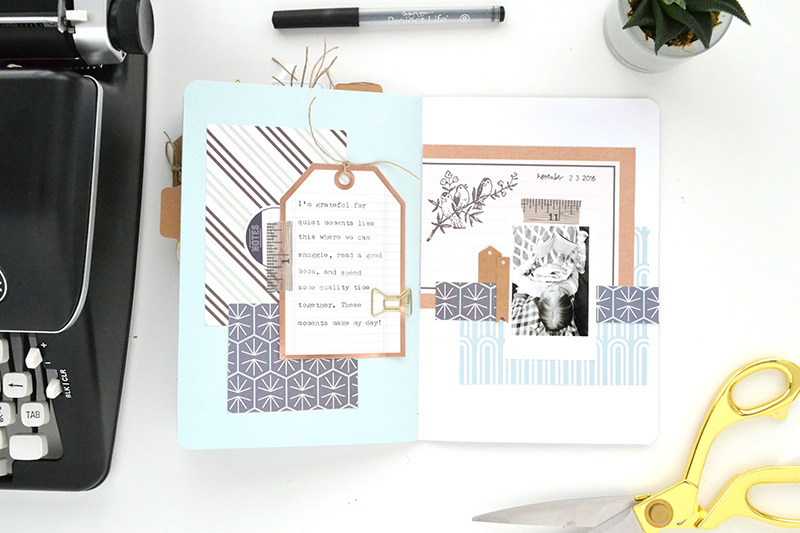 I found a few rolls of washi tape that match my papers and kept those on hand, using some on each page. For this album I journaled with my Typecast typewriter and a Heidi Swapp date stamp. 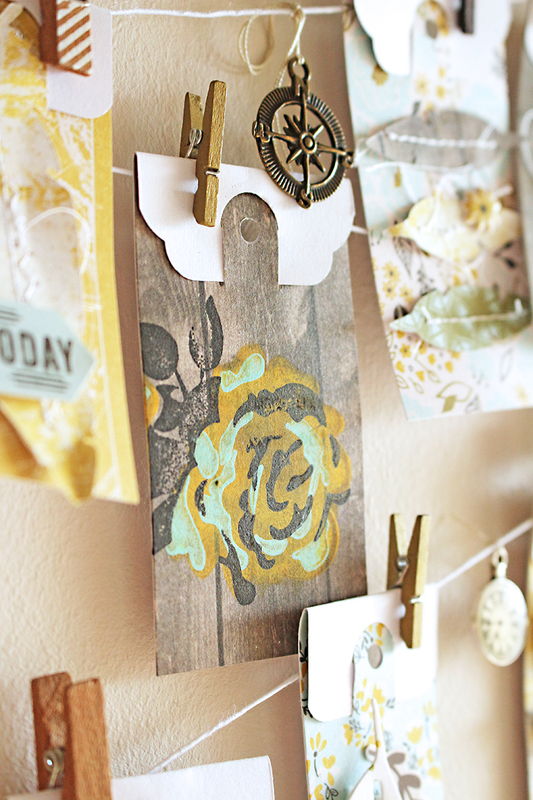 Another tip is that I always like to add some texture with different materials such as metal, fibers, or ribbon. 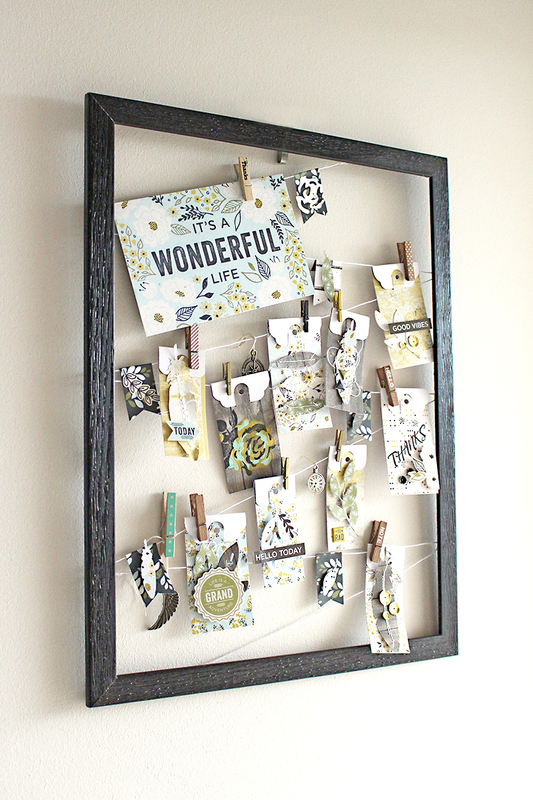 For this project I pulled in some metal shaped paper clips and some jute twine. 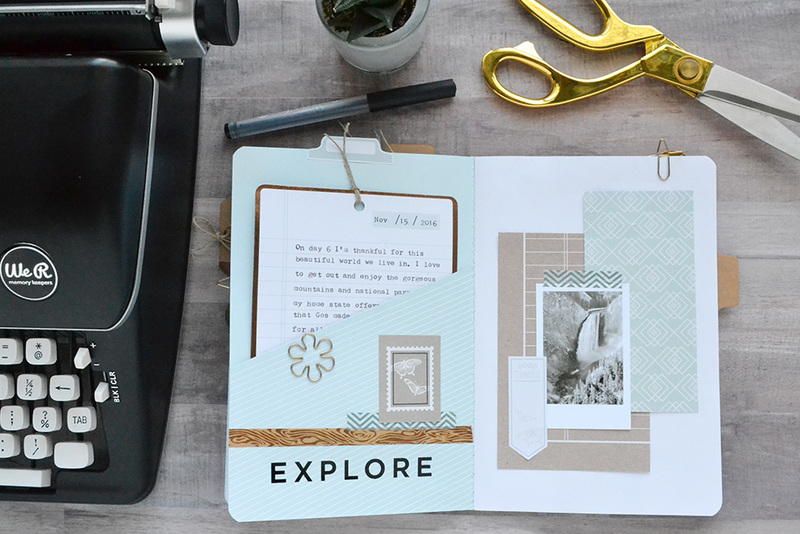 When designing my pages, I start by selecting at least three patterned papers that I can layer as a base. 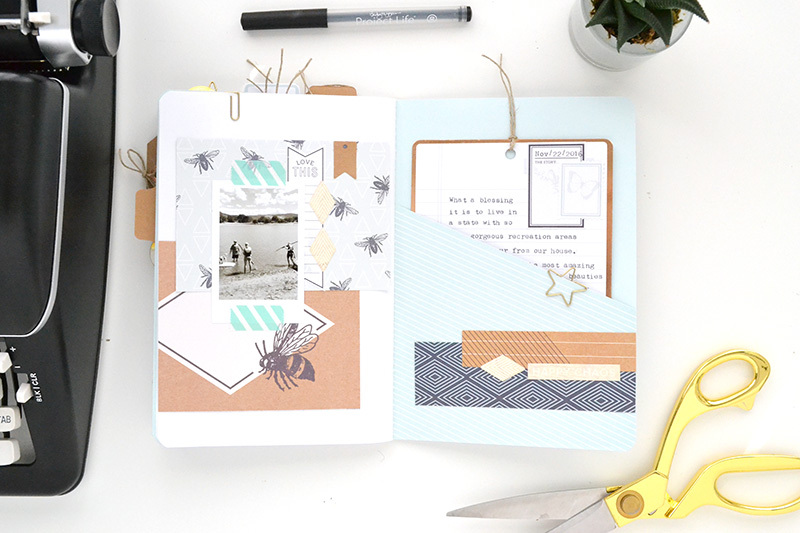 Then I add my photo or journaling card on top of the papers, and finish off with the bits and pieces like washi tape, paper clips, staples, and smaller stickers, labels and tags. 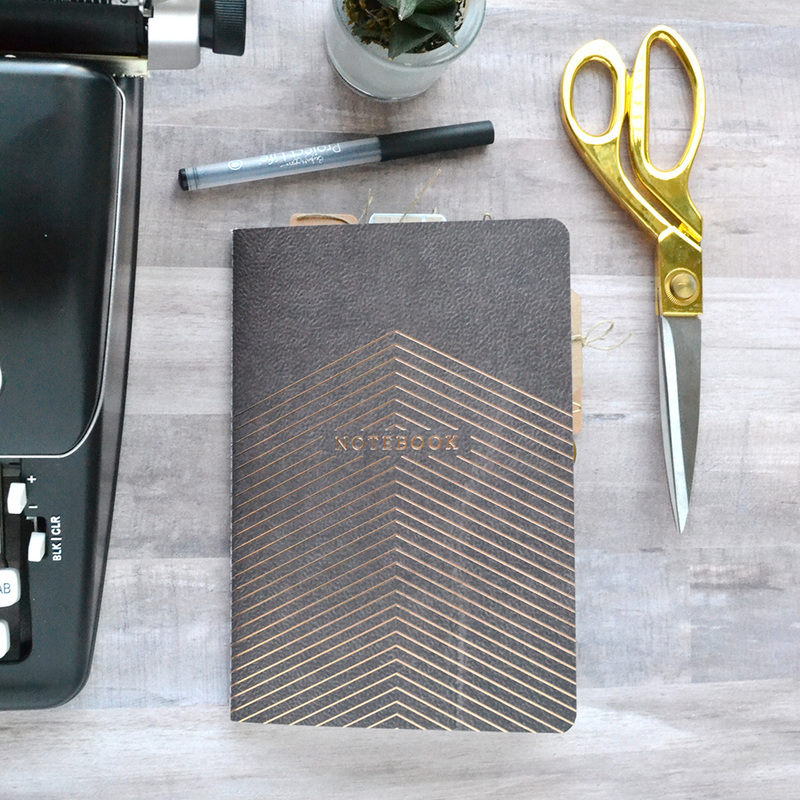 I hope you’ve enjoyed this gratitude journal inspiration. 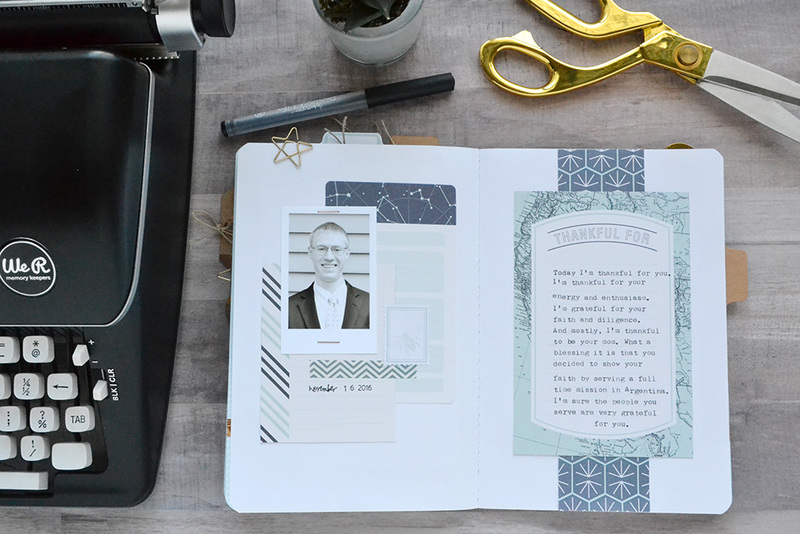 This project is only one way to record your blessings this time of year, but you can do it many other ways as well. The important thing is to get your thoughts down, and to focus on your blessings and all the good things in your life. Hello We R fans and welcome back to the blog today! I don’t know about you, but for me, this time of the year tends to bring with it a sense of review and taking stock of what has unfolded over the course of the last eleven months. As we head straight towards a busy holiday period, it’s good to take a minute to remind ourselves how very blessed we are! I’ve created a bit of a twist on a banner, in that I have hung the banner inside an empty frame. 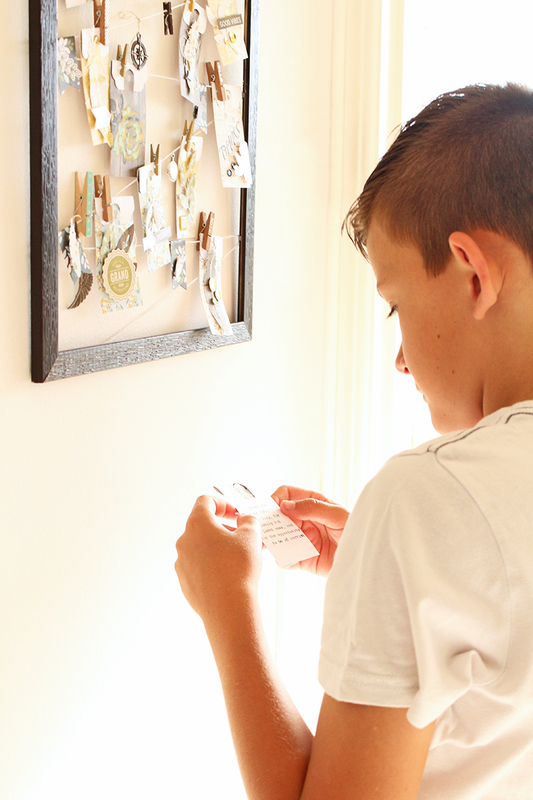 On it, I have hung various tags which each contain an uplifting quote or something we, as a family, are grateful for – a great little pick-me-up at any time of day. I’ve hung it right by our front door so we can all see and make use of it. 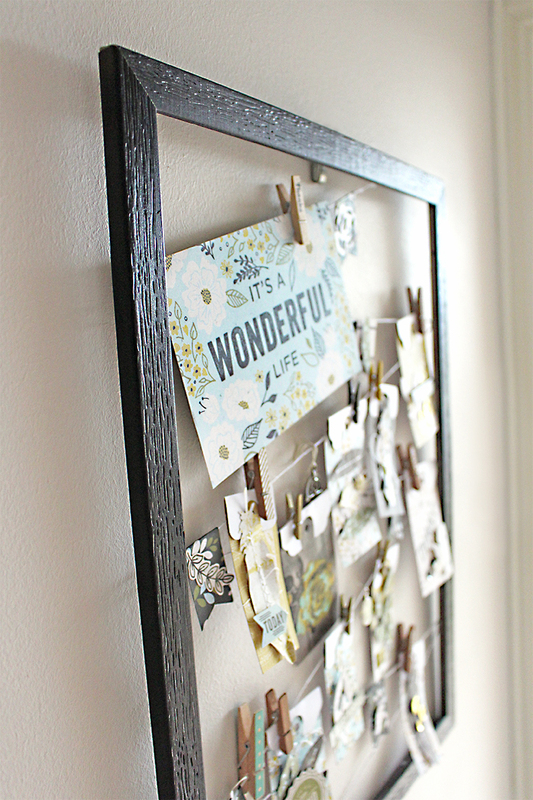 The picture frame is just an inexpensive one I bought. I removed the glass and board inside so that I was just left with the wooden frame. 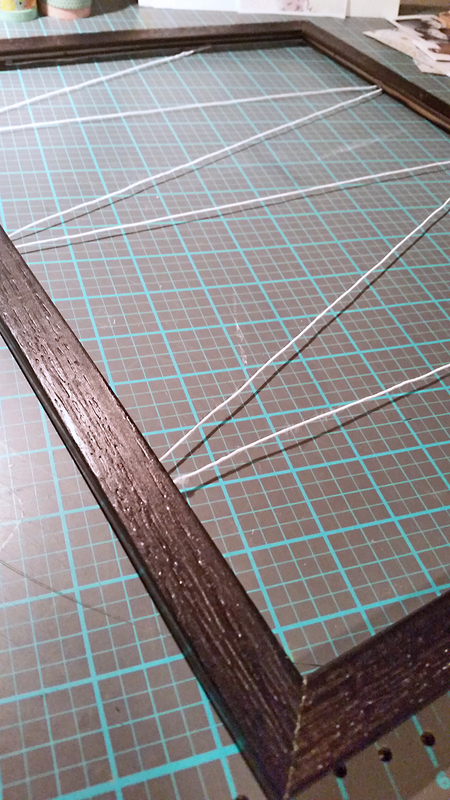 Using some covered wire, I strung the wire in a zig-zag fashion down the length of the frame. Note: The little bendy metal bits at the back of the frame that usually hold down the glass etc, were perfect for holding the wire down! Each little tag is slightly different. 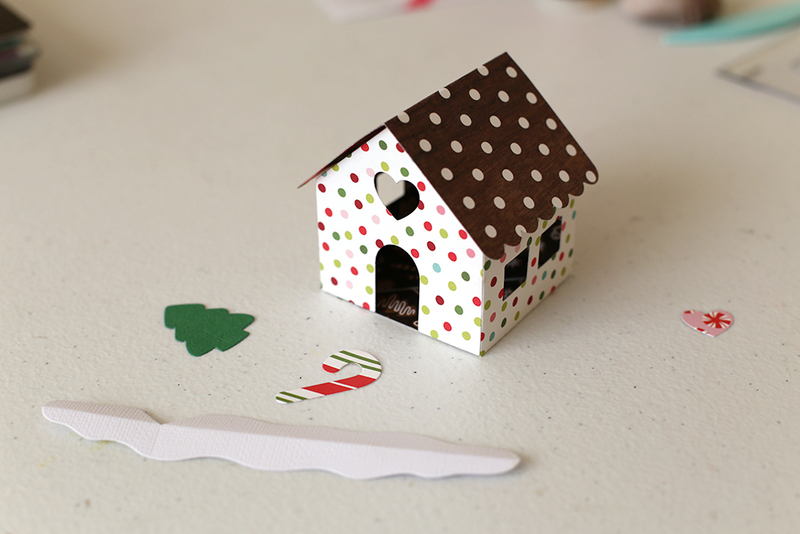 I created the basic shapes using my DIY Party Tag Punch. Do yourself a favour and add this punch to your stash!! 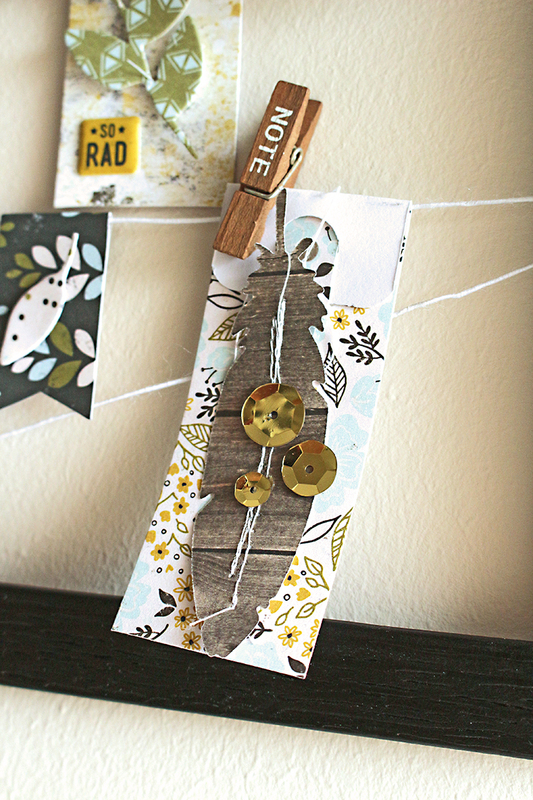 For this project I used 1 and 2 inch wide tags. 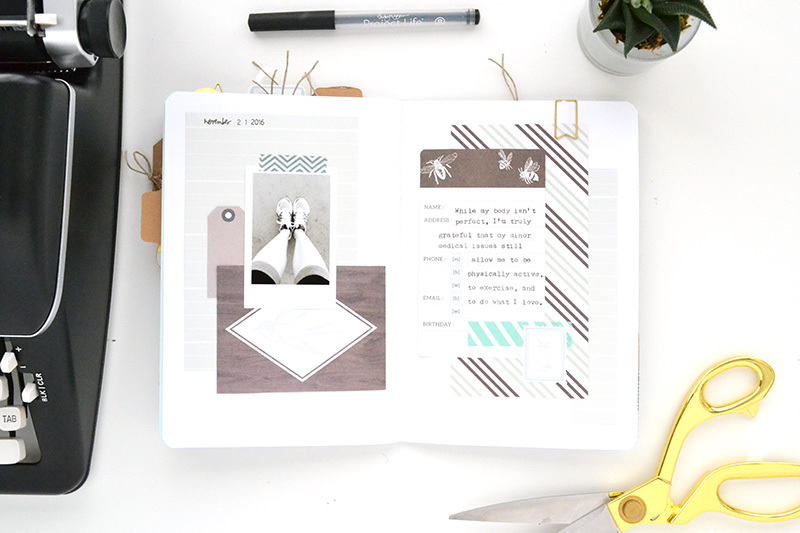 Note: I’ve used the High Five 6×6 pad for the tags – the reason being that the pages are only printed with a pattern on one side, which was perfect for my quote idea. These particular tags have some feather embellishments. They are paper die cut shapes which I created using my Evolution Advanced and some more of the High Five 6×6 sheets. 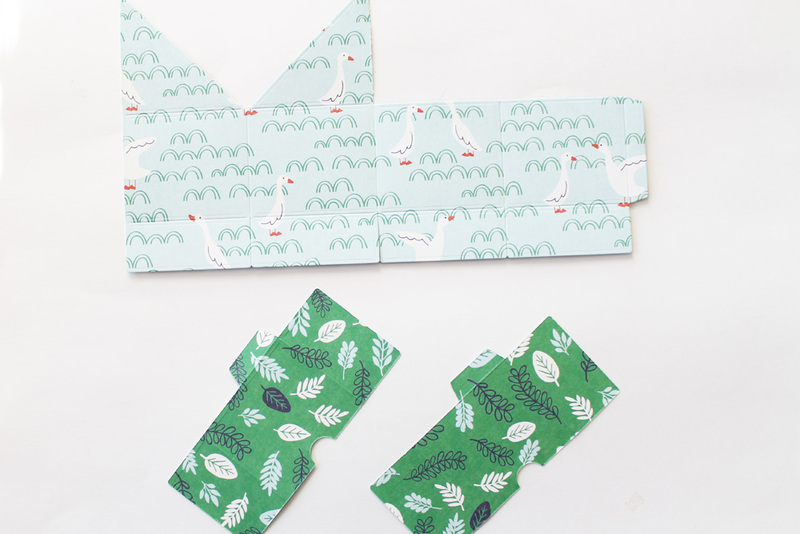 TIP: A bit of machine stitching will bring leaves and feathers to life. 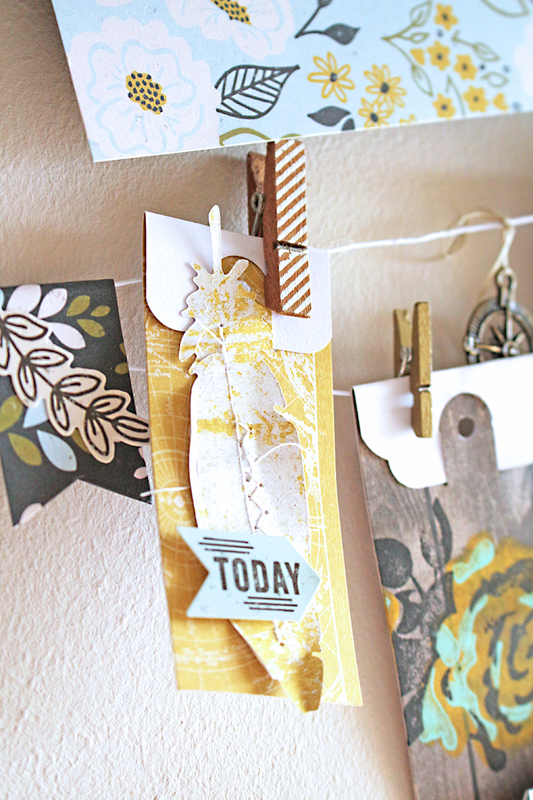 This awesome wood grain paper print shows off a little layered stamping perfectly. 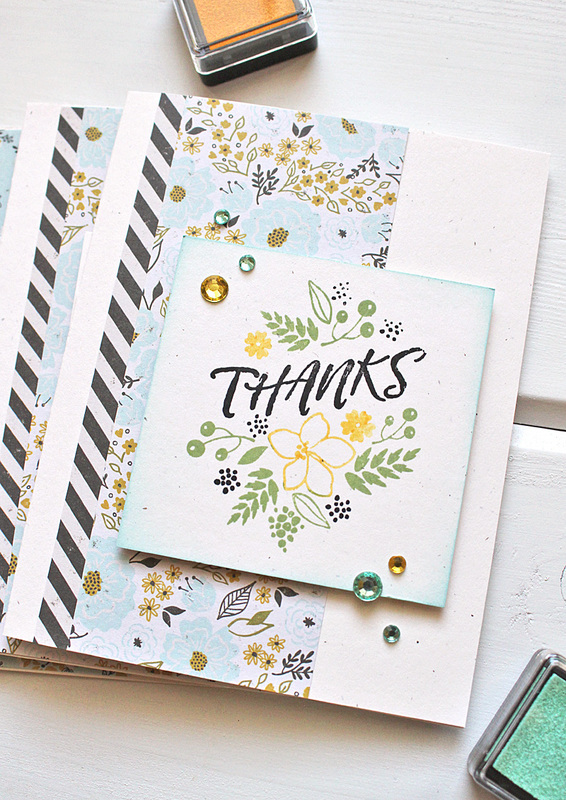 I used my Rose Layered Stamp and Mini Stamp Pads with the Precision Press and just love the way the stamping worked out. 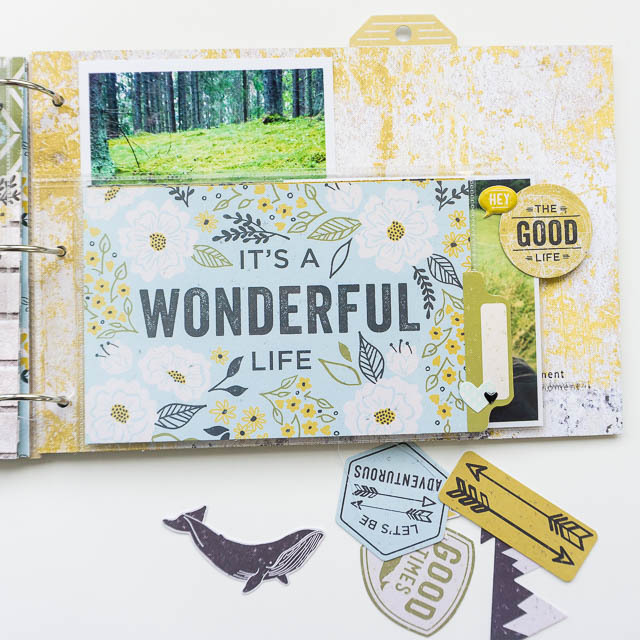 Using the new Layered Stamps is so easy, thanks to the guide, which is included in the set. Below you can see how I lined up my guide to stamp on my tag. Press down the lid part of the Precision Press grabs the stamp to keep in place. The layered sets each have a couple of stamps, numbered, so you know in what order to stamp. 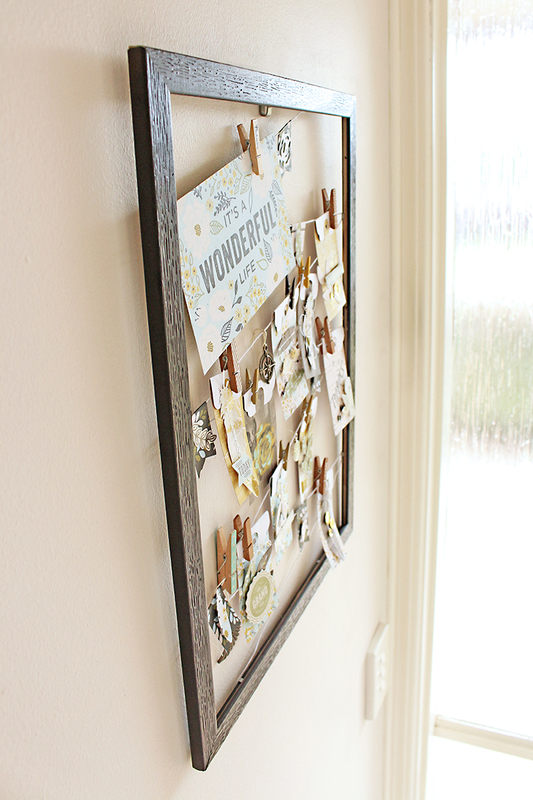 Simply change out the number inside the frame which is already in place so all your stamps line up perfectly! 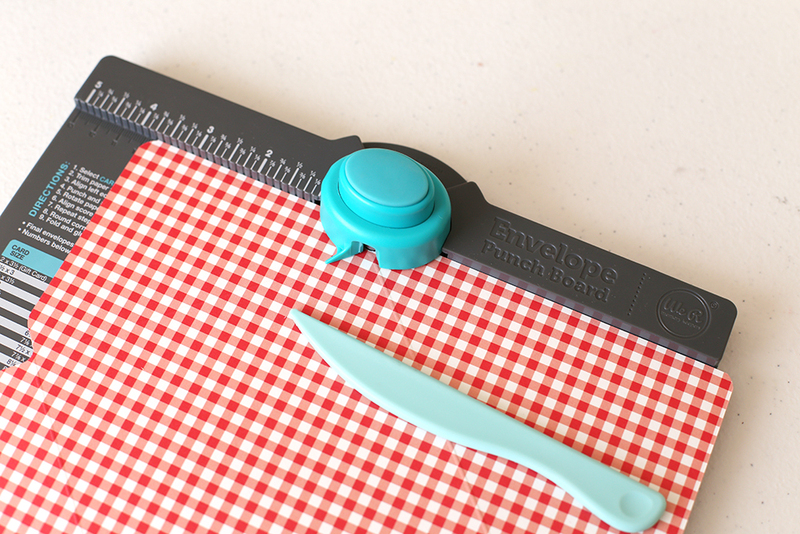 A great tip for more precise placement or if you want to use up leftover bits, is to use the Magnetic Mat in your Evolution Advanced. It keeps your dies in place so you can make use of all available space on the paper and the dies don’t slide around on the mat. 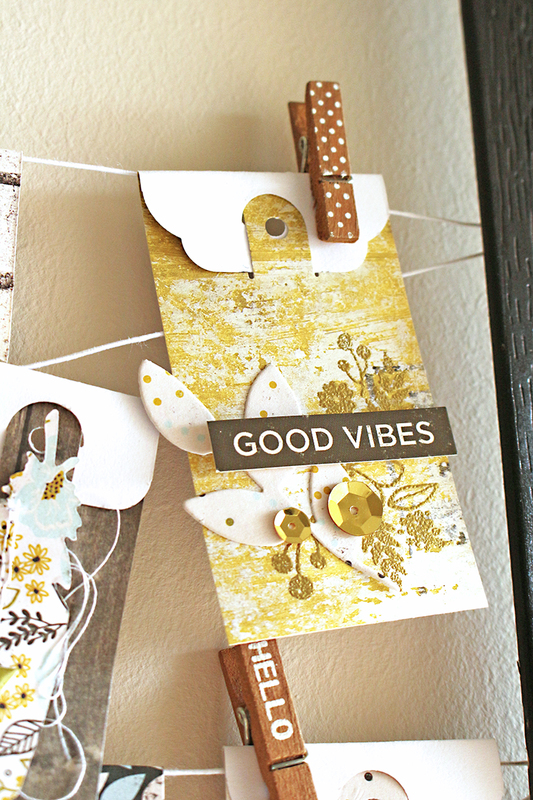 This tag has some gold heat embossing detail as well as a few other bits and bobs. 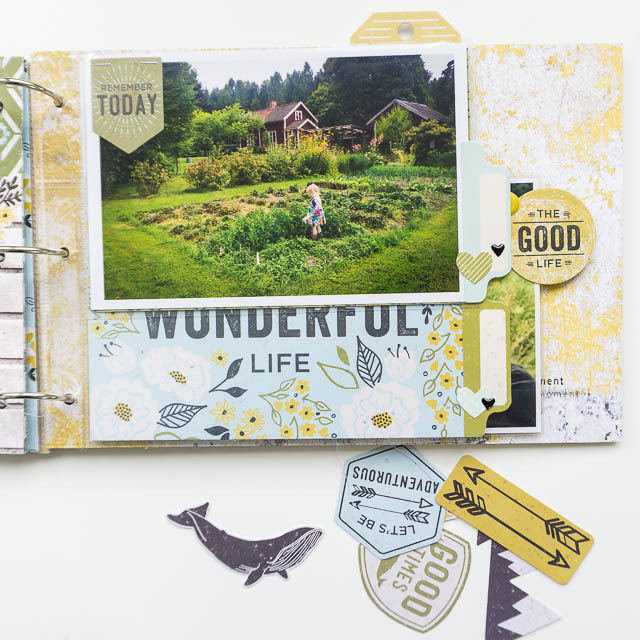 I’ve used the Banner Layered stamp and only stamped around half the image. 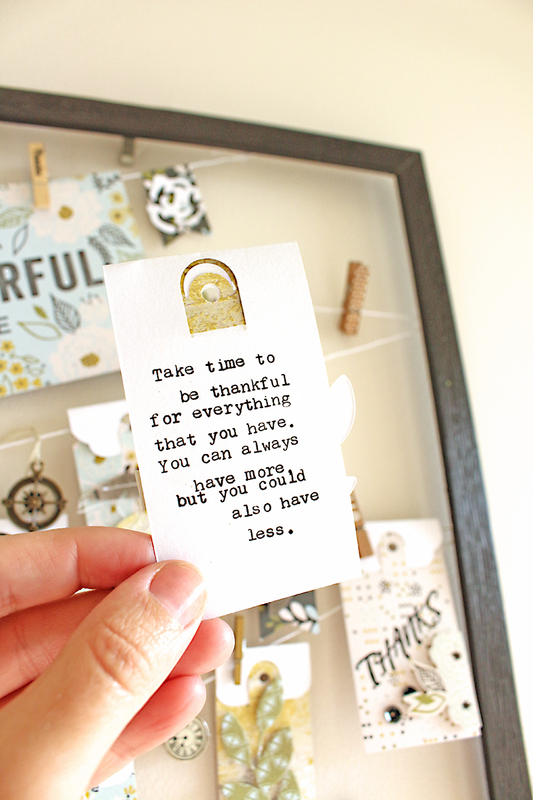 Once all my tags were ready it was time to have some fun… I searched for some classic thankful quotes on the net and combined them with some thoughts on my own special family members. In between the tags are some very small details. A wing (to remember we are protected), a clock (time goes fast – make the most of it) and a compass (for the journey). My DS reaching for a bit of inspiration! 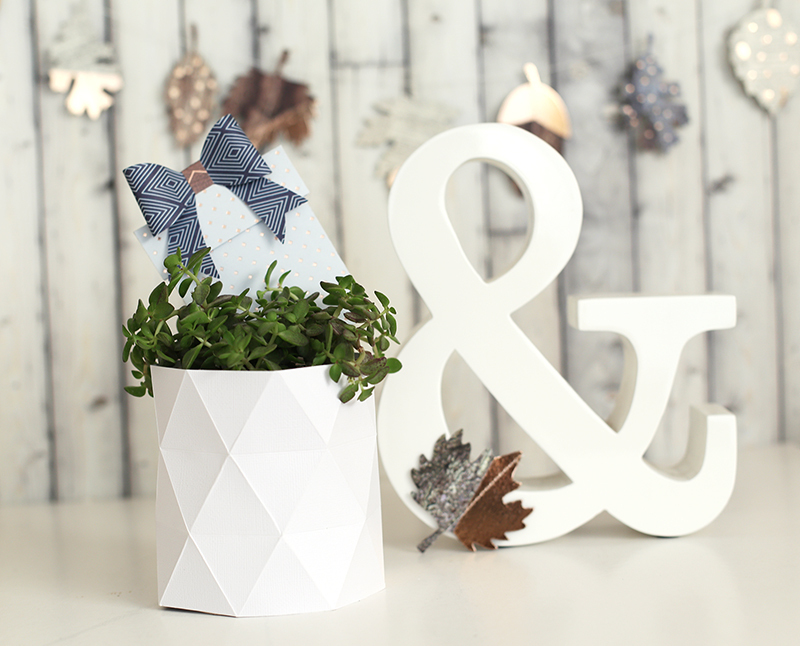 You could adapt this idea to suit a season or a special birthday or anniversary gift! Hello friends! 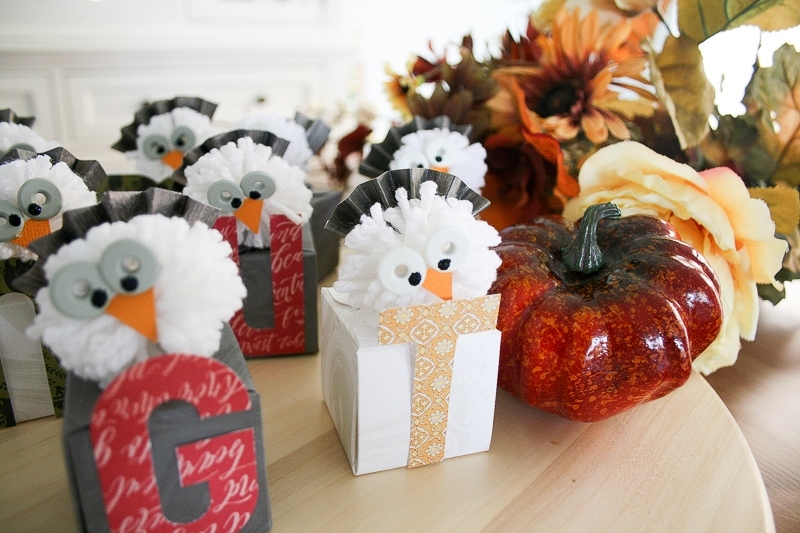 Eva Pizarro here today sharing quick hostess gift made for this Thanksgiving party. I love all the Thanksgiving theme gifts but for me nothing is more meaningful than some kind words. 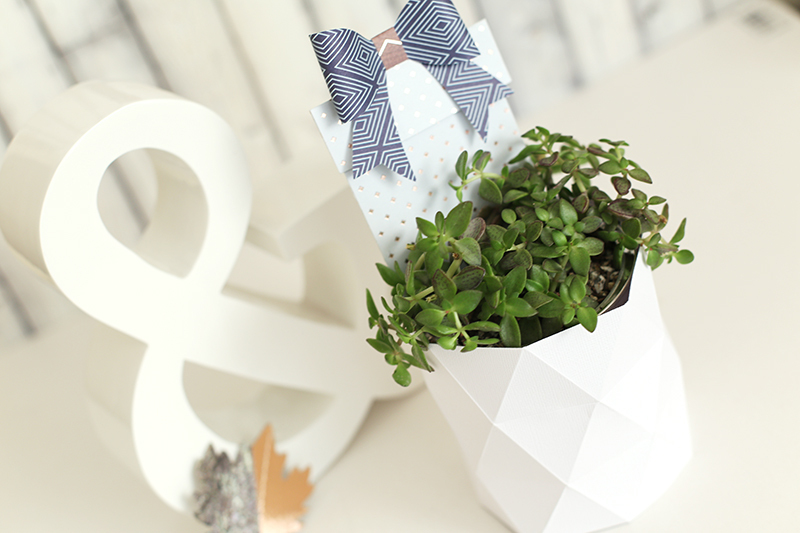 For this gift I made a geometric planter and added a card made with the Gift Card Holder die set. Instead of a gift card I placed a note thanking my friends for inviting us to their first Thanksgiving party! 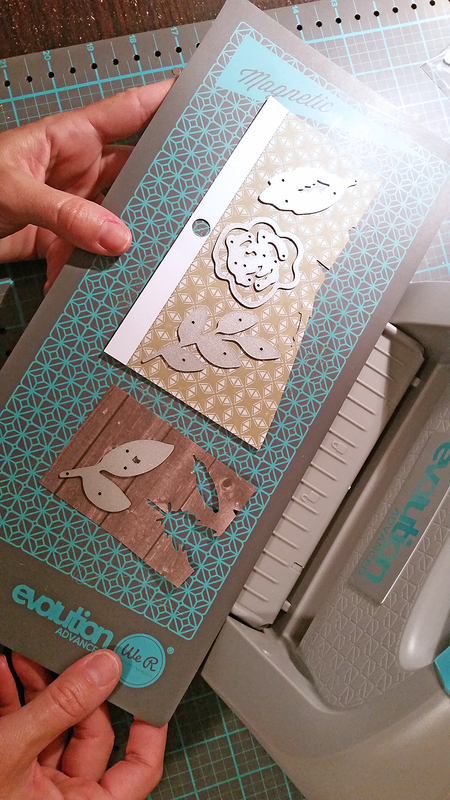 To make the card, simply use your Evolution Advanced to cut all the pieces of your Gift card Holder Set. 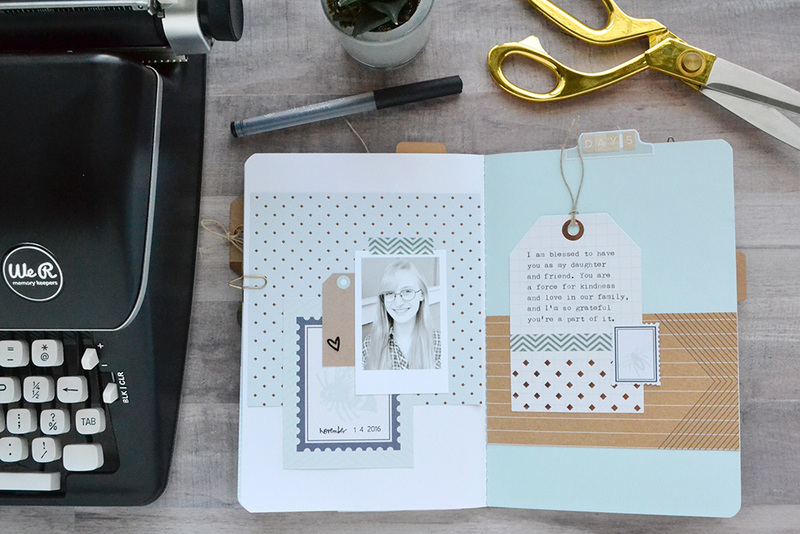 I used the new Typecast Collection mixing blue, wood grain and copper colors. 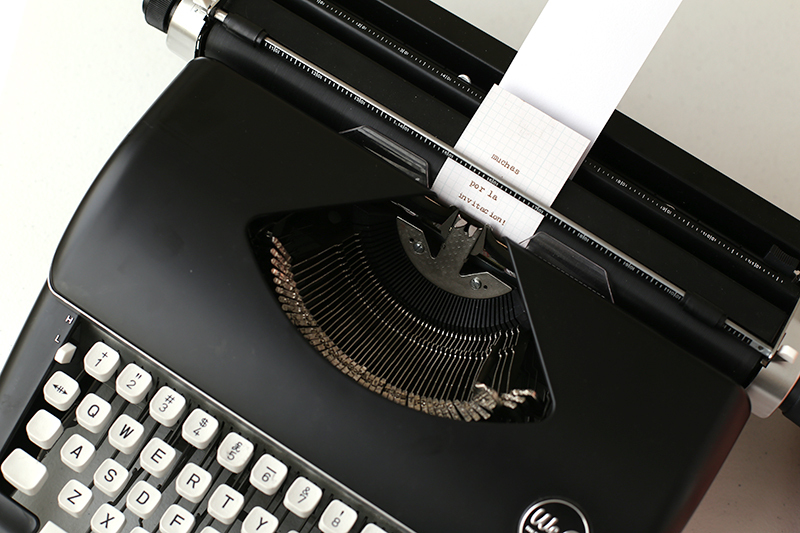 Change your ink color to Gold and use your Typecast Typewriter to write a thank you note for your hostess. To make the planter Use your Trim And Score Board and your Triangle Score Guide. Just follow the instructions on the booklet. I scored my lines every 1 ½ inch. Score your diagonal lines in one direction and your straight lines in the other one. Place your succulent in a can and make some holes on the bottom for better drainage. 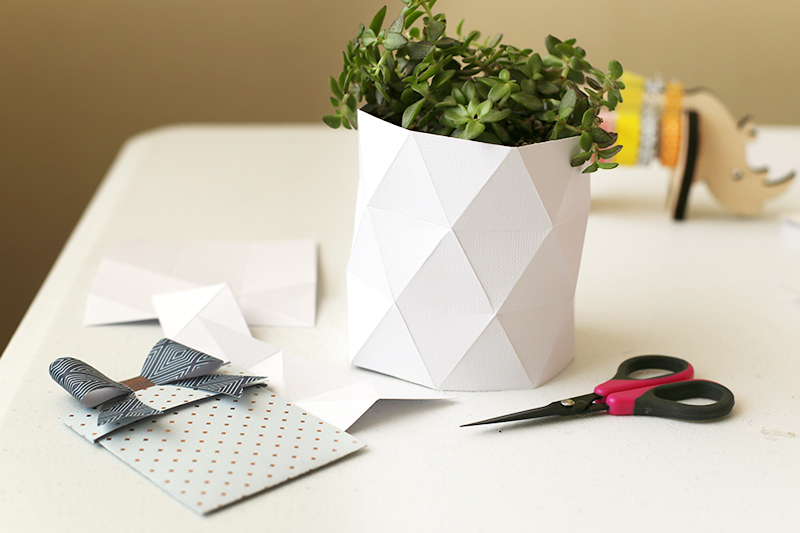 Wrap your paper over the can gluing your paper with some hot glue gun in a few spots. 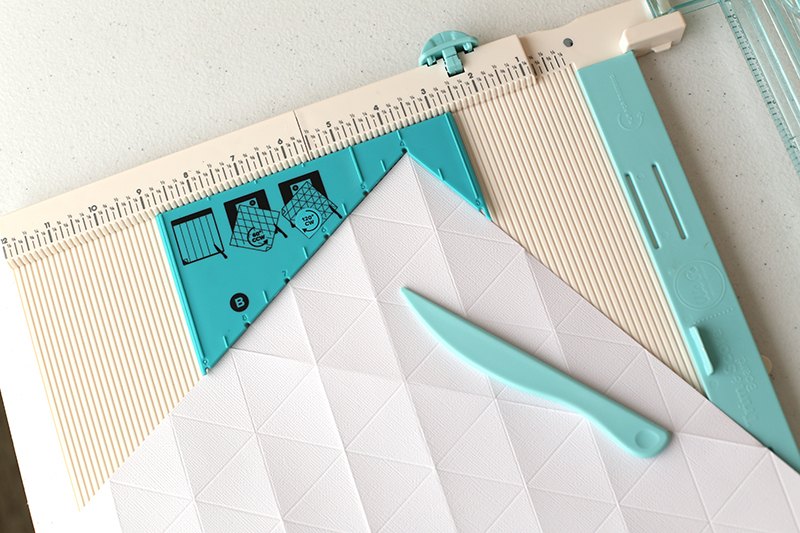 If your paper is not long enough attach another piece making sure you line up the triangles. 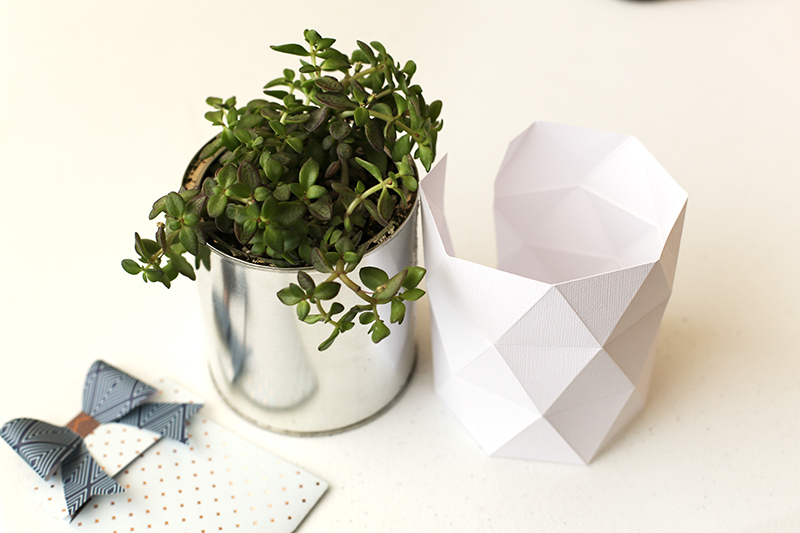 Finally insert a wooden stick on your succulent to hold your card. 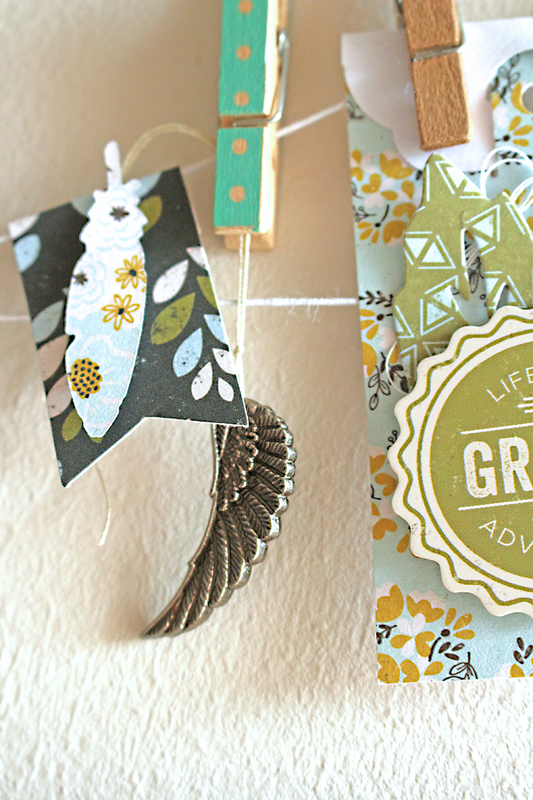 I think the Gift Card Holder set is perfect for a sweet message! I think my friend is going to be thrilled with the plant and the card. Do you bring hostess gifts to your parties? 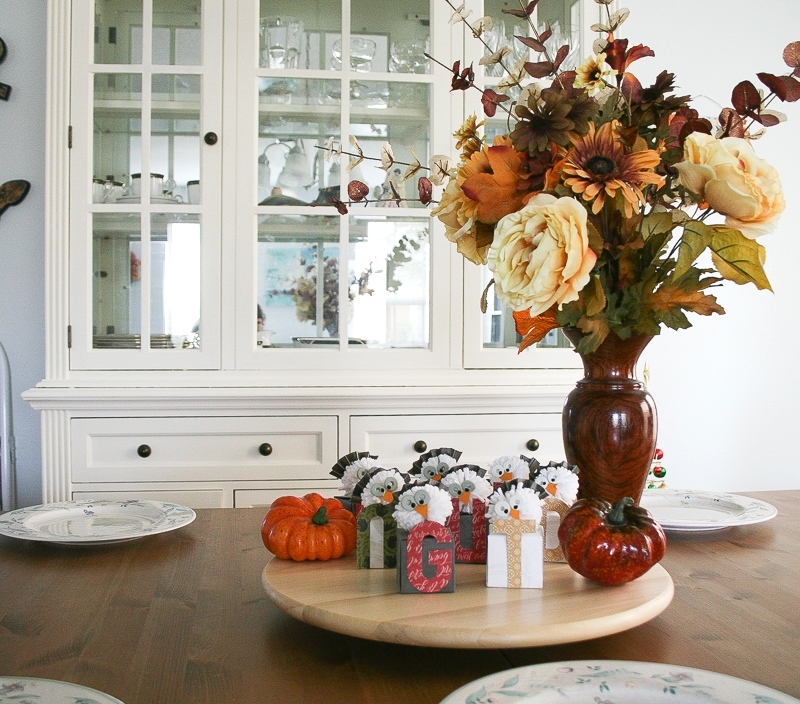 Welcome to my Thanksgiving table, We R Memory fans! Wendy Antenucci here today. I wanted to make place cards for my table to dress things up and with the help of a few amazing We R Memory Keepers tools that has been achieved! 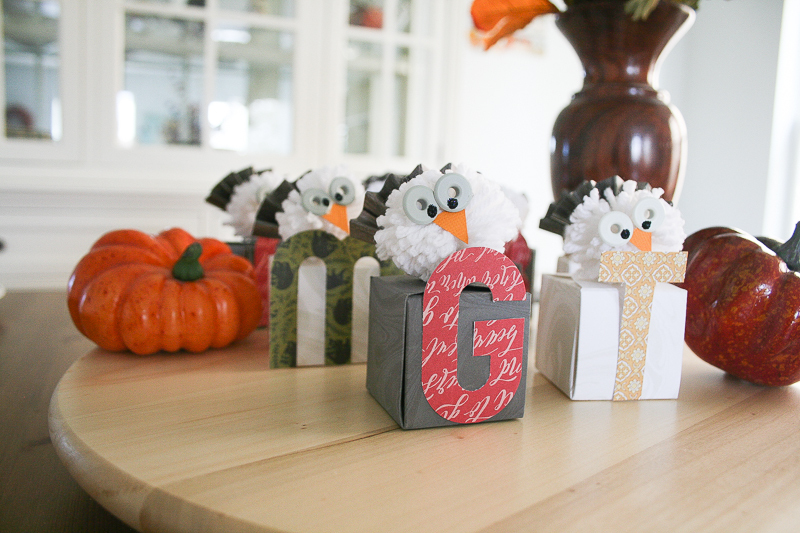 I began my place cards using the 1-2-3 Punch Board to create boxes which I filled with some goodies for the kids. 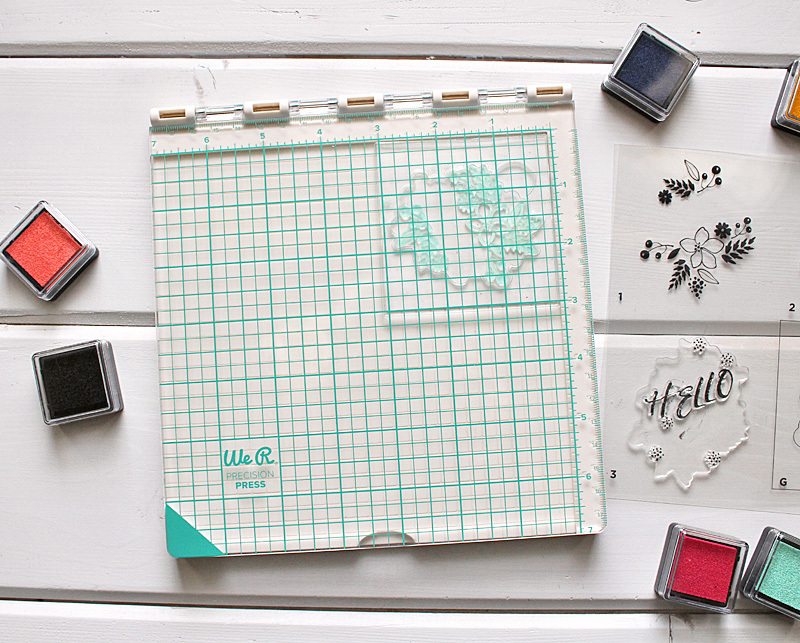 I wanted to use my 6×6 paper pads so my box dimensions were 1¾ inches, perfect for little treats and the perfect size to hold the mini alpha punch board letters. I used hot glue to hold the sides of my boxes together and then I adhered the letters to the outside of the box. The next part of my project was using the pom pom maker, I chose the small size to create fluffy pom poms for the top of my boxes. 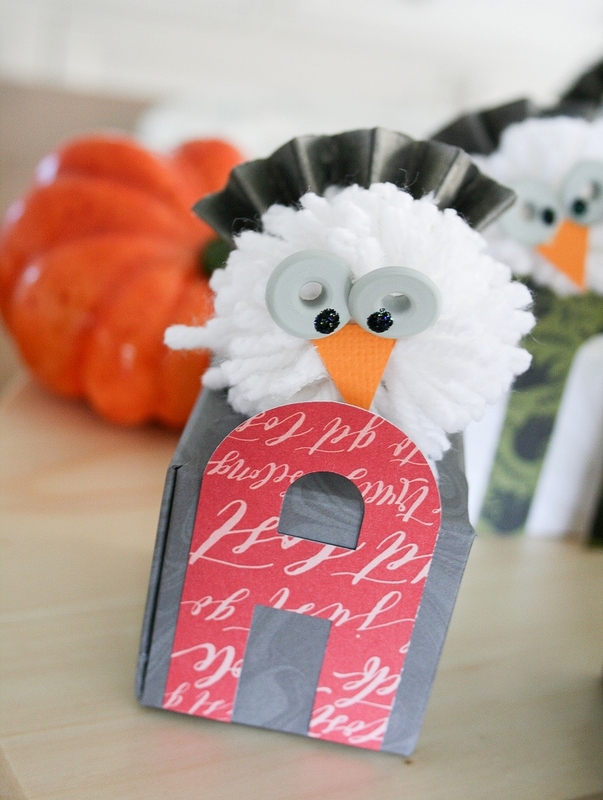 I began my project with the idea of creating some leaves and attaching a tag, but the pom poms were calling for more! I had a brain storm to create a rosette to use as a turkey tail, and it worked! I used my 6×6 paper pad and my Fringe & Score board to make the rosette. I then cut the 6×6 folded strips into 3 pieces to give me the tails of my turkeys. Using the staple board I stapled one end of the tail and fanned out the other side, then attached this to the pom poms. 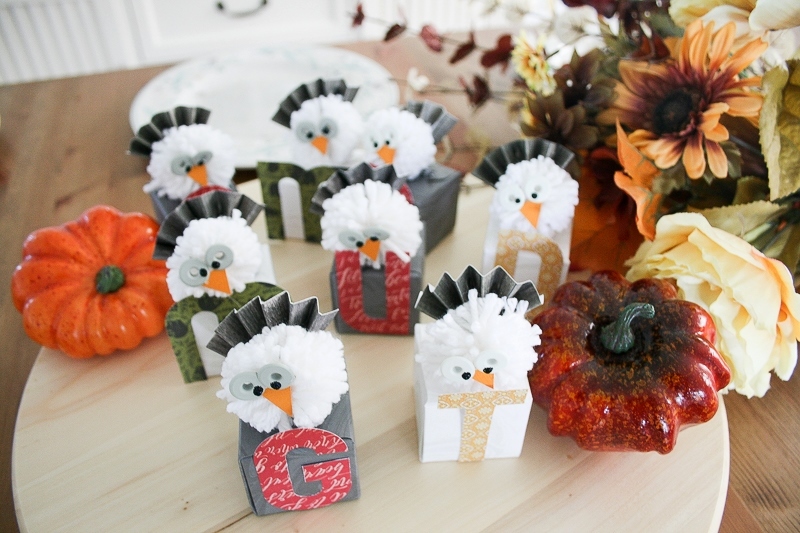 Next my turkeys needed eyes; using the wide eyelets in white and beige colors I glued these onto the pom poms and then added in small orange triangles for the beaks. Black glitter glue was the final touches for the eyes. And here is one final close-up of our table decorations for Thanksgiving. 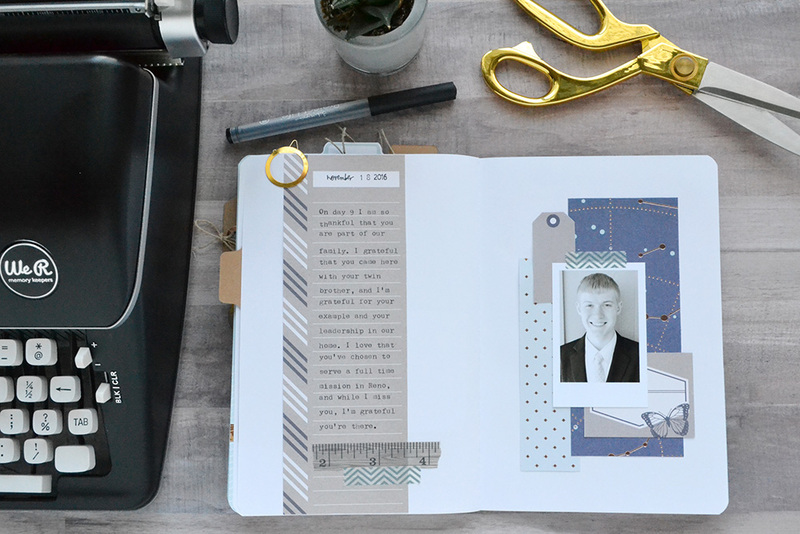 Don’t you love how innovative the We R Memory Maker tools allow you to be? Thanks for joining me today and we’d love to see what you are creating! 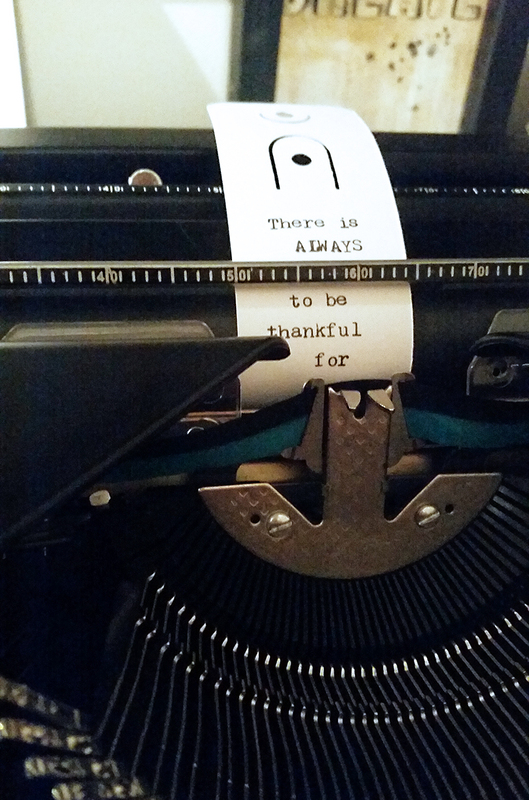 It’s been awesome to focus on one thing I’m grateful for each day and write my feelings about it. I look forward to continuing this project through Thanksgiving Day next week when I’ll be back with the rest of my album. See you then! I have been begging my family for this tool for the last month since it came out. 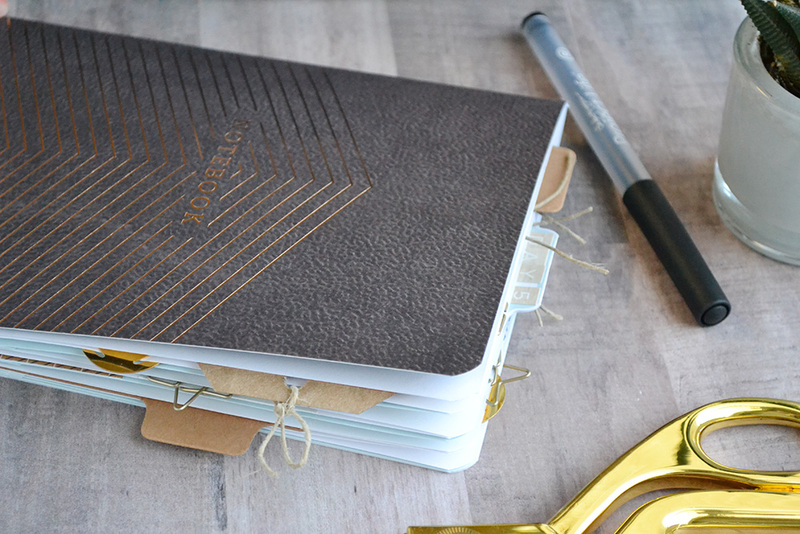 I have been eyeing it for making cards and planner covers as well as other things that pops into my heart to make. Fingers crossed and thank you for the chance. Congratulations Kassi! Please send an email to alyd@americancrafts.com with “Precision Press Winner” in the subject line. Include your full name and shipping address and we’ll get you your prize asap.